One of the things I love about Italians is that they love a festival. 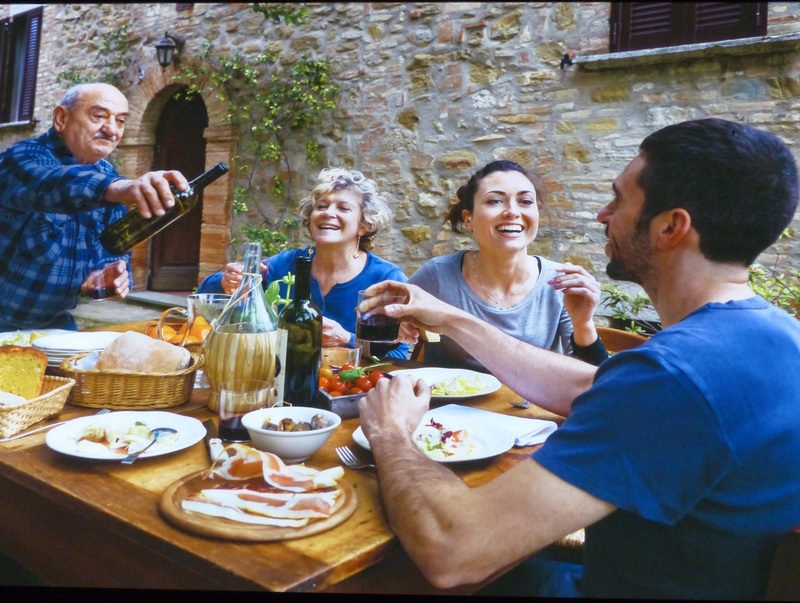 Any opportunity to celebrate local food, wines, traditions and culture is seized upon with enthusiasm. 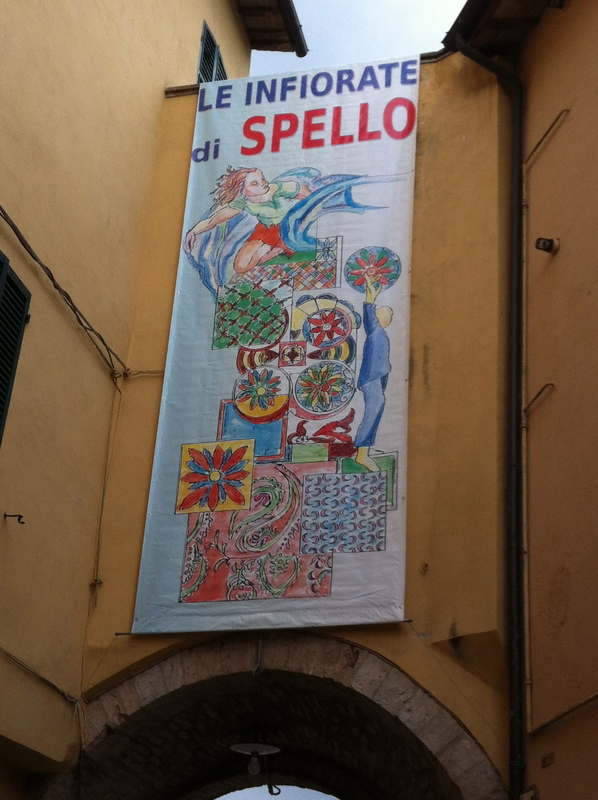 One such cultural event which we were privileged to attend this week was the Spello Photo Fest. Organised largely by Fabrizio Corvi, who has a studio in Spello, and Barbera Pinci, it was a celebration of the work of fifteen talented photographers. 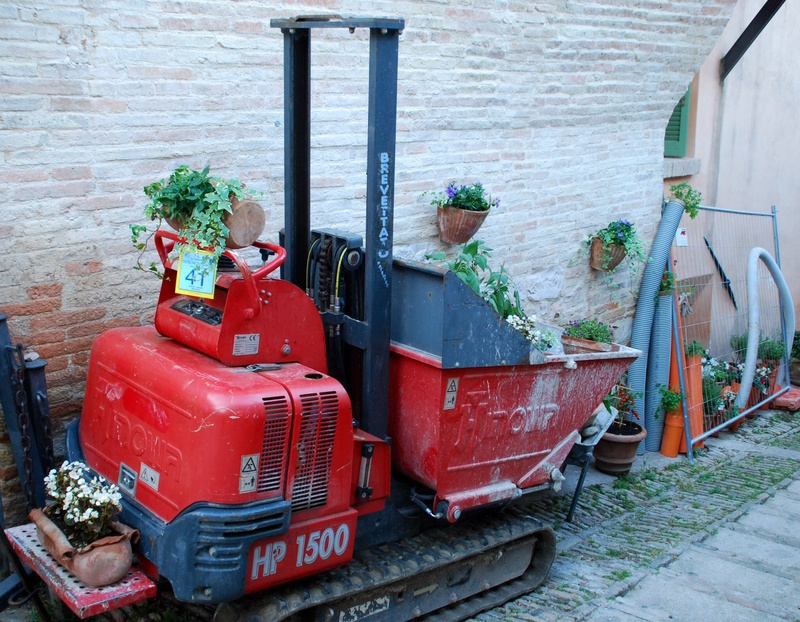 Local people opened up their garages, storage spaces and unrestored buildings to host the exhibitions in the ancient Via Giulia. This meant that as well as the art on show, we were allowed a secret peek into the wonderful old buildings which are usually hidden behind large wooden doors. 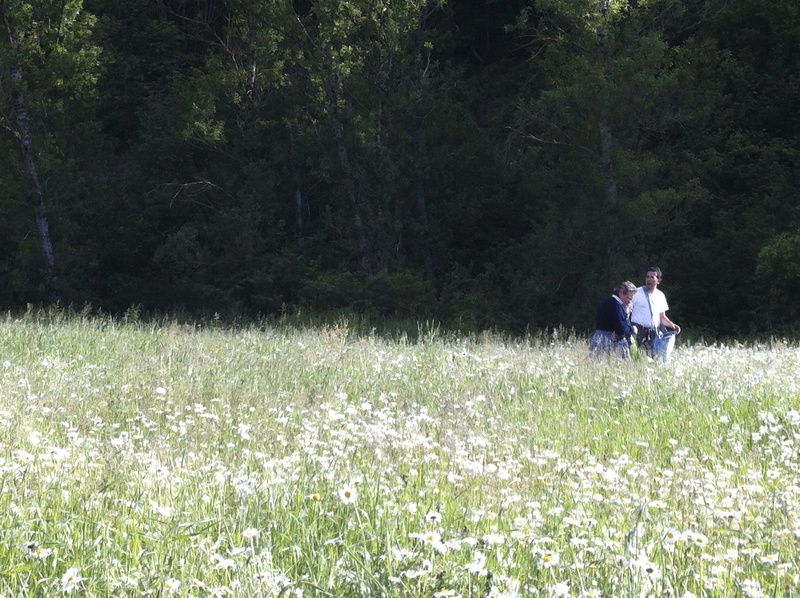 This particular space was enhanced by the view across the fields and hills: a framed picture in itself…. 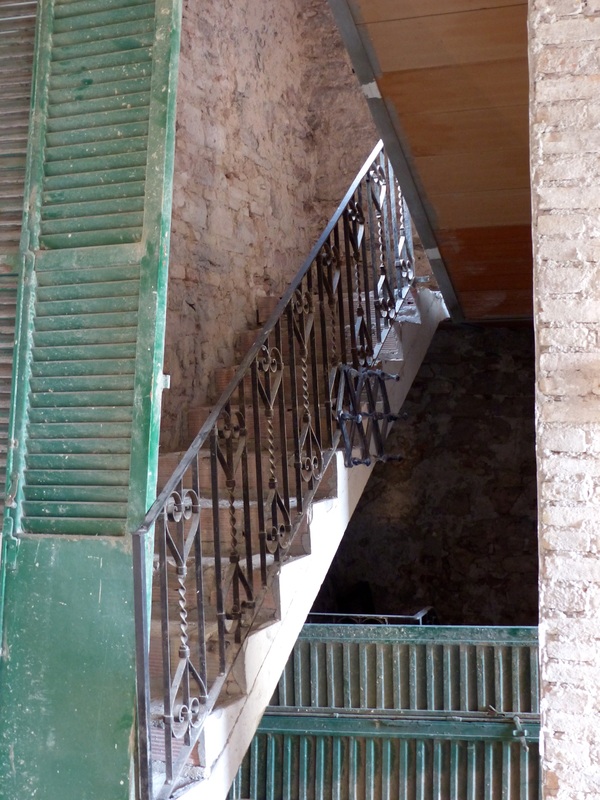 Interiors offered glimpses into crumbling rooms, waiting to be brought back into use…. The exhibits themselves were extremely varied. 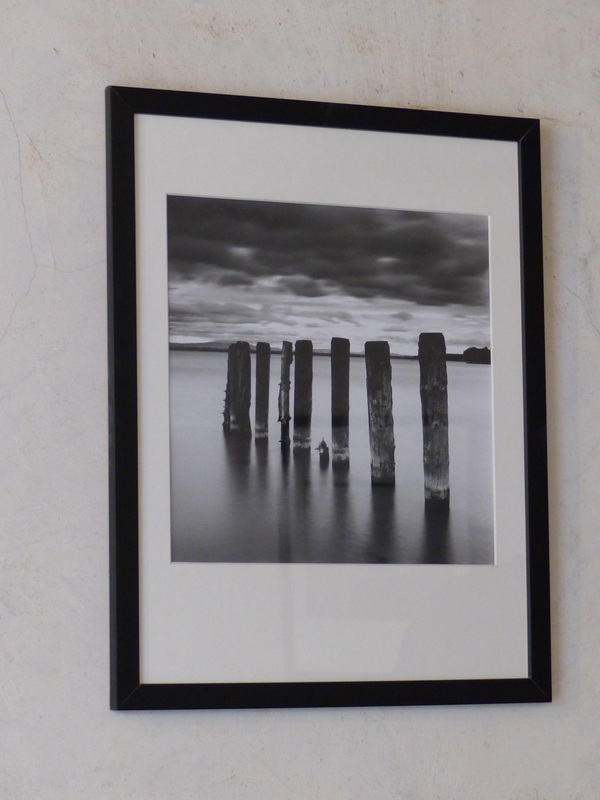 There were haunting black and white photos by Deigo Good that drew you into his mystical world…. 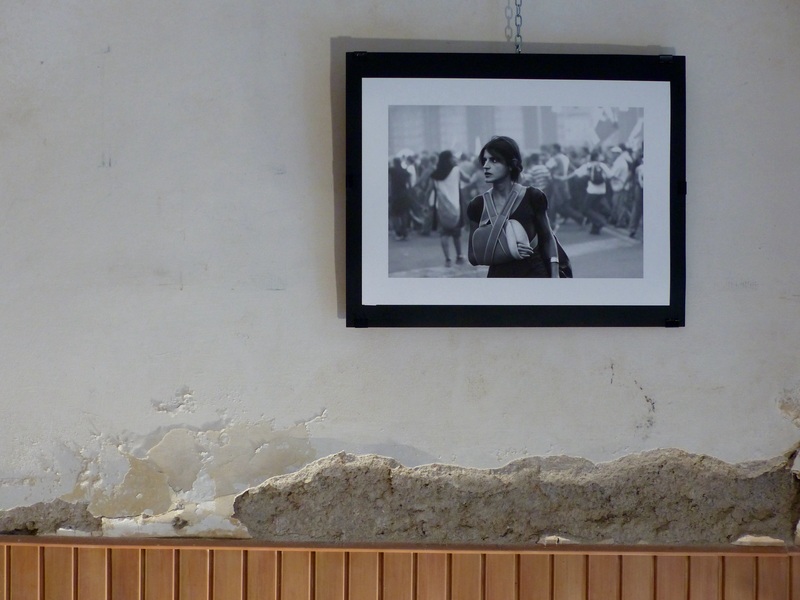 Artists such as Andrea Cianca documented the struggle of Italians who came out onto the streets as a last resort to defend things that were dear to them, such as their land and their jobs. These were harsh realities, tenderly portrayed. 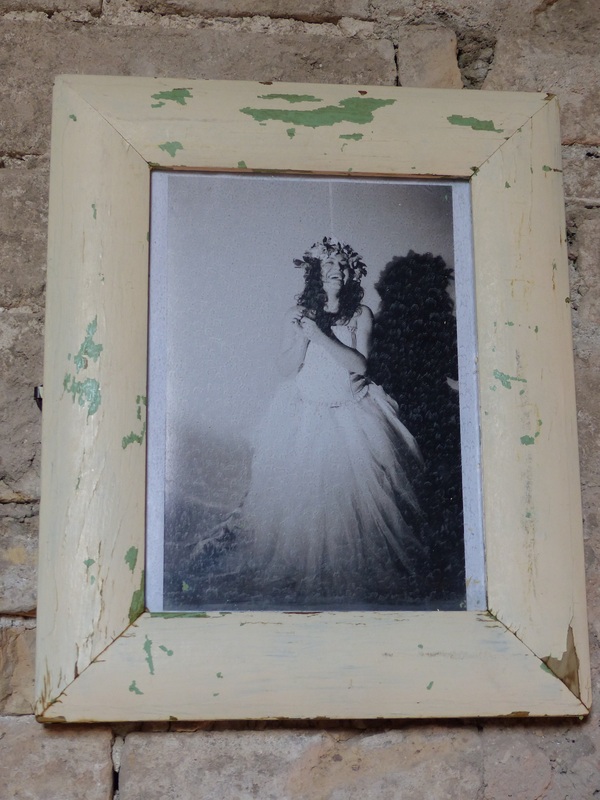 A laughing bride was presented in a distressed frame against a rustic wall…. 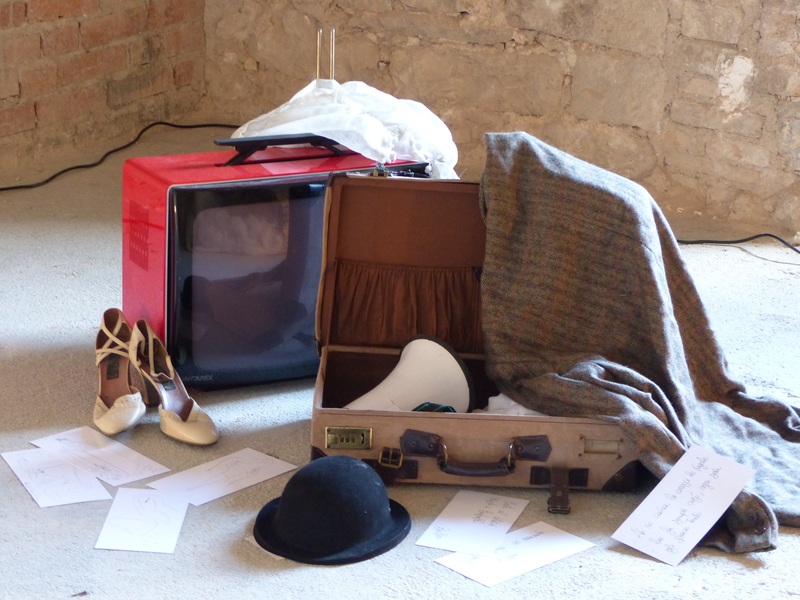 As well as the more traditional works, there were contemporary exhibits such as this mix of familiar objects. Who wore these shoes? Who watched this TV? Whose lives are we part of for a few fleeting minutes? Fabio Galioti recreated a 16th century painting by Caravaggio – The Calling of Saint Matthew – in a 9 minute film entitled “In the Light”. The characters were positioned exactly as in the painting, and as we watched they moved really slowly. It was an unusual and moving piece. 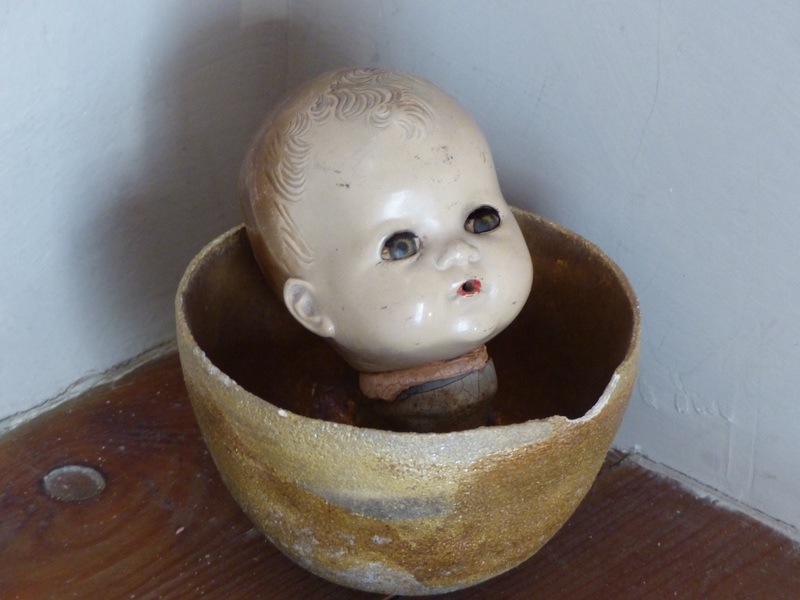 Was this doll’s head meant to remind us of childhood, or to give us nightmares? 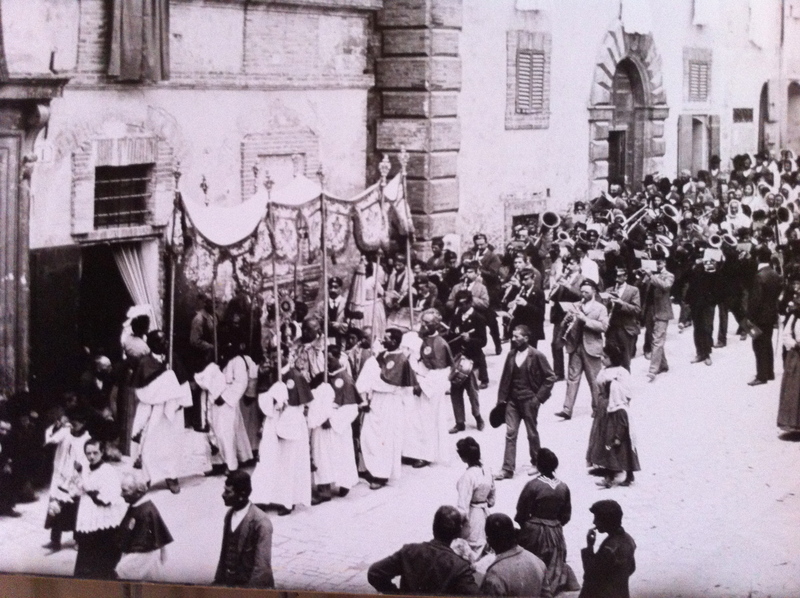 In a local cafe there was a display of old photographs of Spello and the people of Spello – the Spellani. 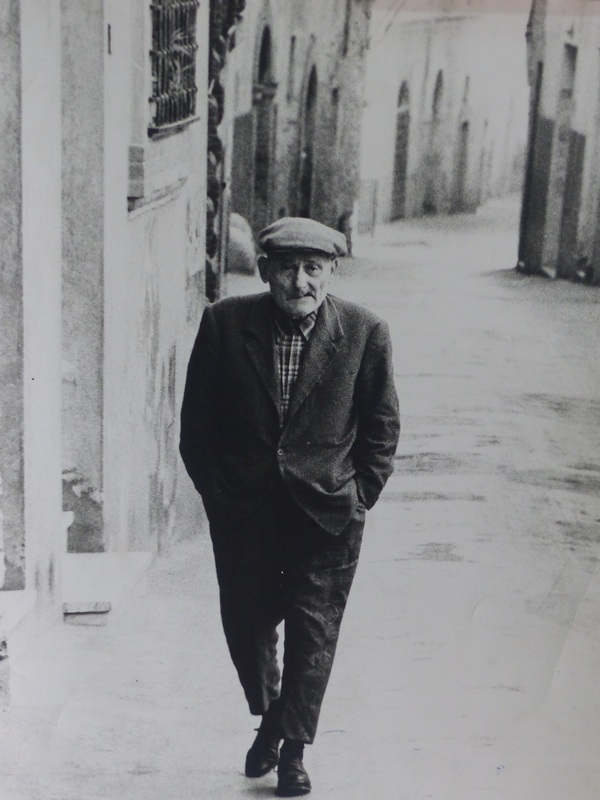 This picture was really evocative – taken in Via Guilia which has hardly changed. 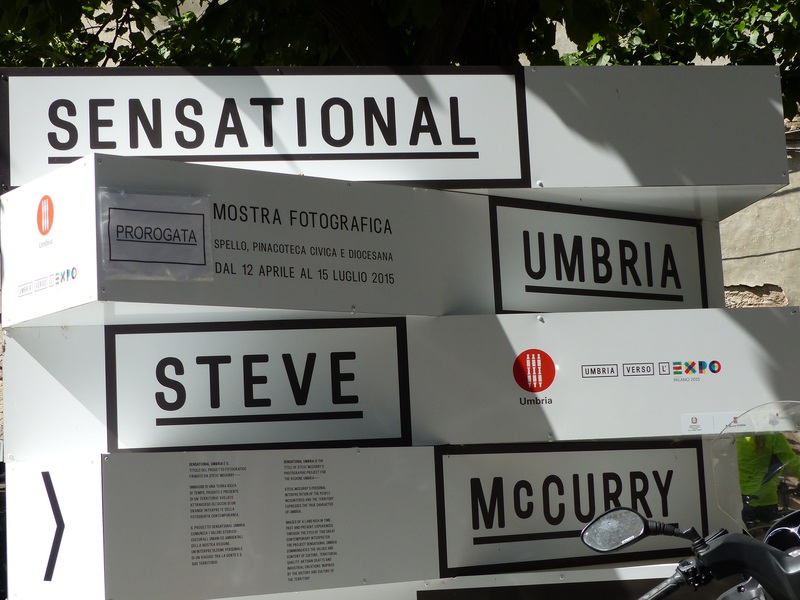 In Spello’s tiny museum there was another celebration of photography, this time by the American photographer Steve McCurry containing photos of Umbria. Steve McCurry is perhaps best known for his beautiful colour photos in the documentary tradition, including his striking portrait “Afghan Girl” which first appeared in National Geographic magazine. (We saw this recently at an exhibition “Drawn by Light” in London’s Science Museum). Steve McCurry’s photographs were beautifully presented, lit from behind in a darkened room. They are full of life, full of colour and display a real empathy for the people he portrays. 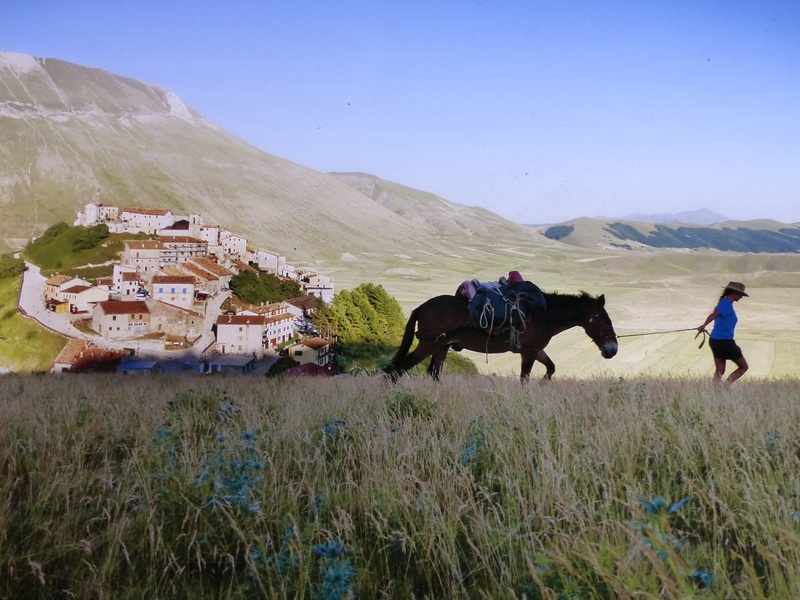 This photo of a horse rider taken near Castellucio di Norcia – an area known as the Tibet of Italy – could almost be a painting…. 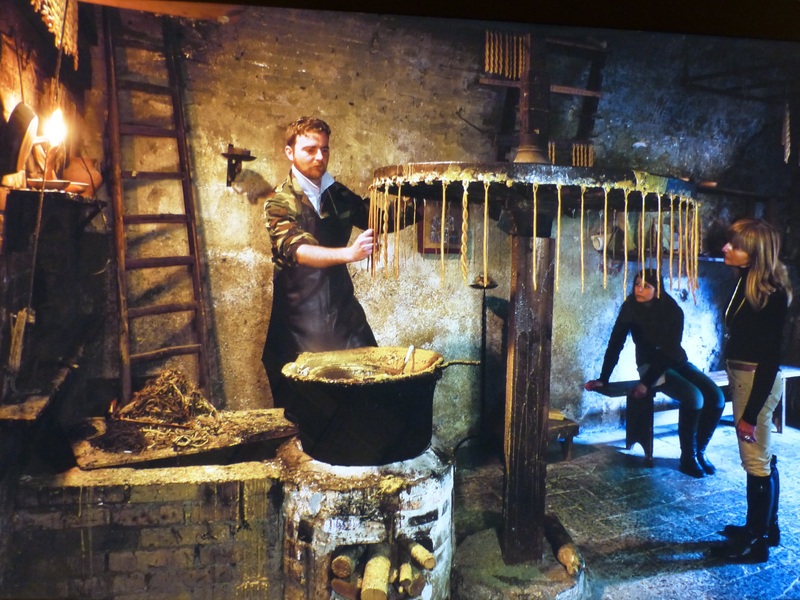 In Bevagna at the medieval market of the Gaite held each June, he captured this recreation of an ancient craft, lit like a Vermeer painting…. His photos are inspirational; it is easy to see why he is considered to be a master of his craft. 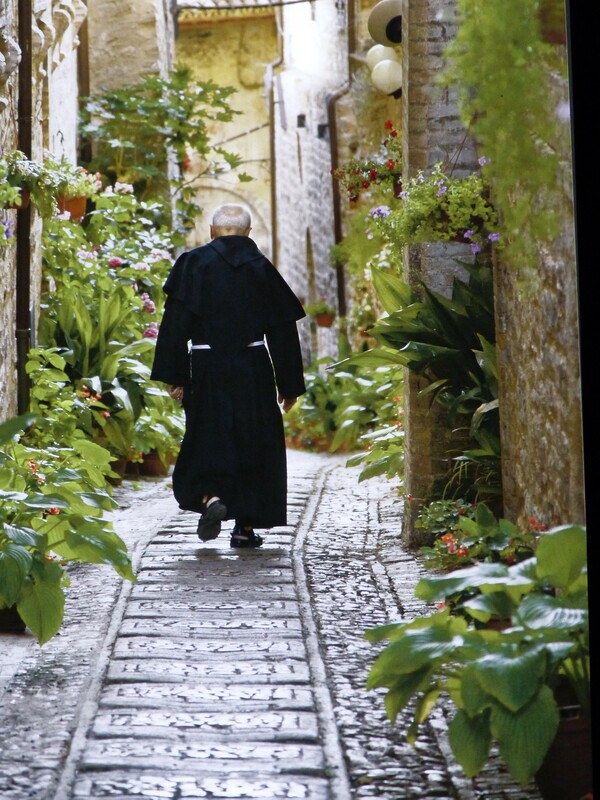 This entry was posted in Italian Life, Photography, Spello Festivals, Travel, Umbrian Hill Towns and tagged Andrea Cianca, Diego Good, Fabrizio Corvi, Spello Photo Fest 2015, Spells, Steve McCurry, Umbrian hill towns on September 13, 2015 by maryshoobridge. You have to be up early to beat the crowds on the feast of Corpus Christi. 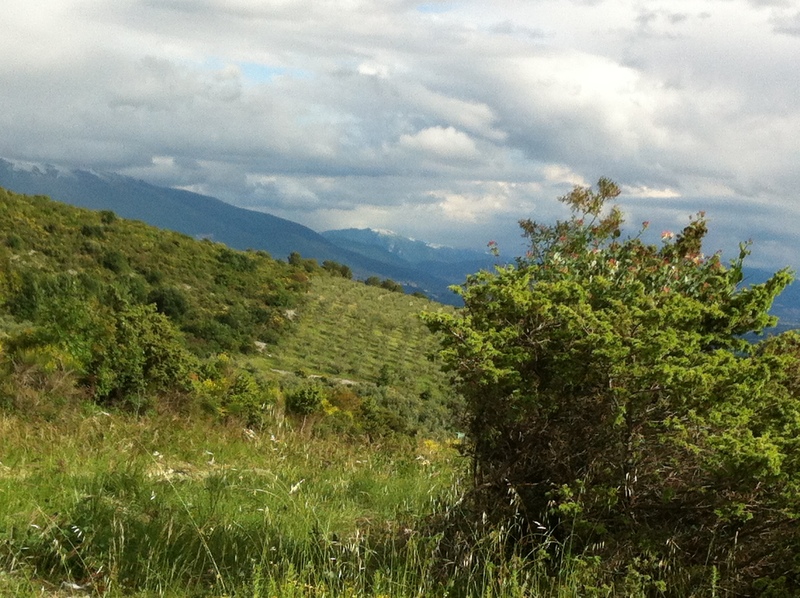 The population of the small town of Spello is around 8,000, but on this day it swells to around 80,000. 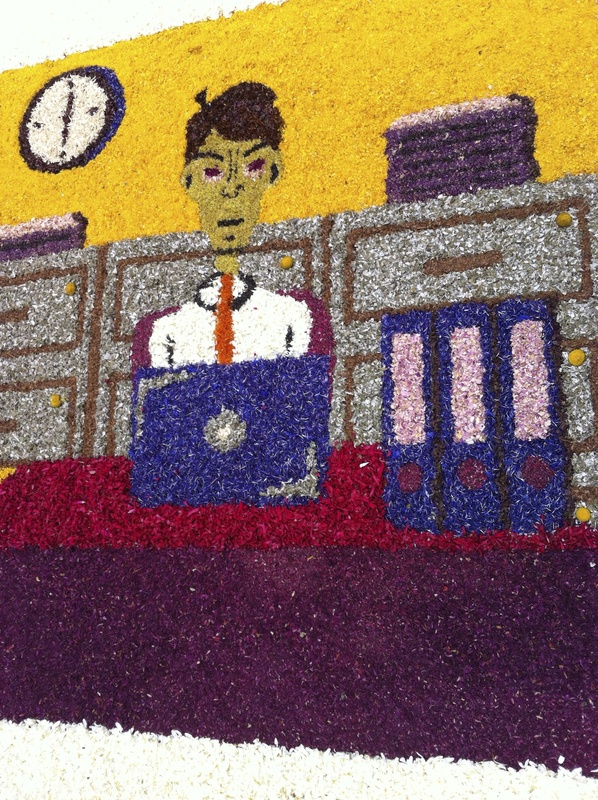 Droves of people arrive in coaches and cars or on foot to see the spectacular displays of pictures created with flowers. 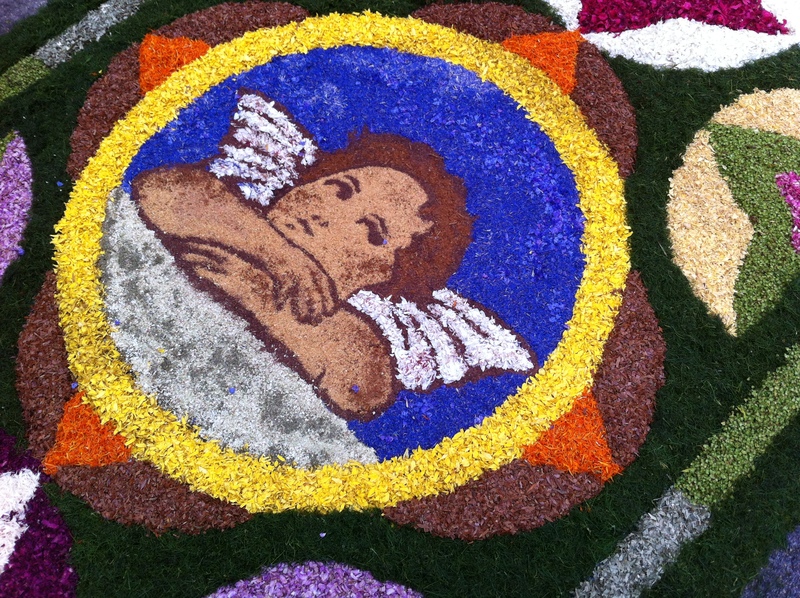 Spello’s biggest festival, the Infiorata, is underway. 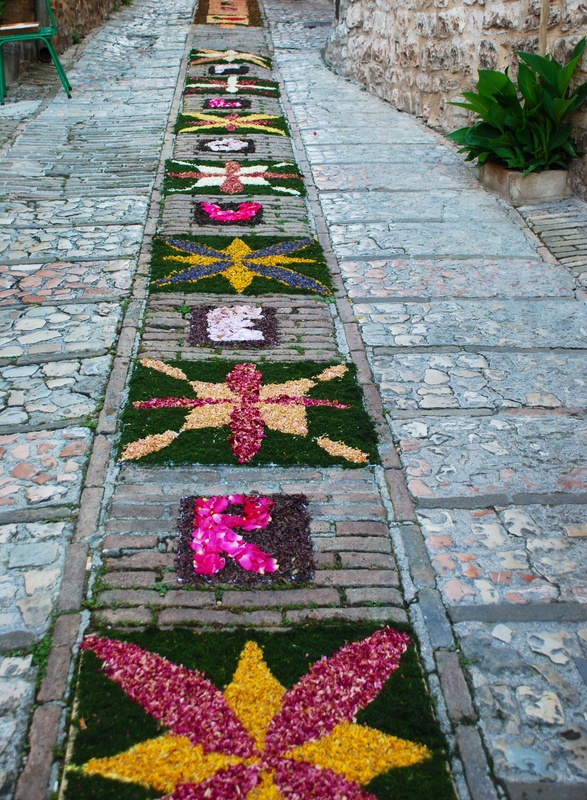 Around 2 kilometres of floral carpets cover Spello’s winding streets, alleyways and squares. 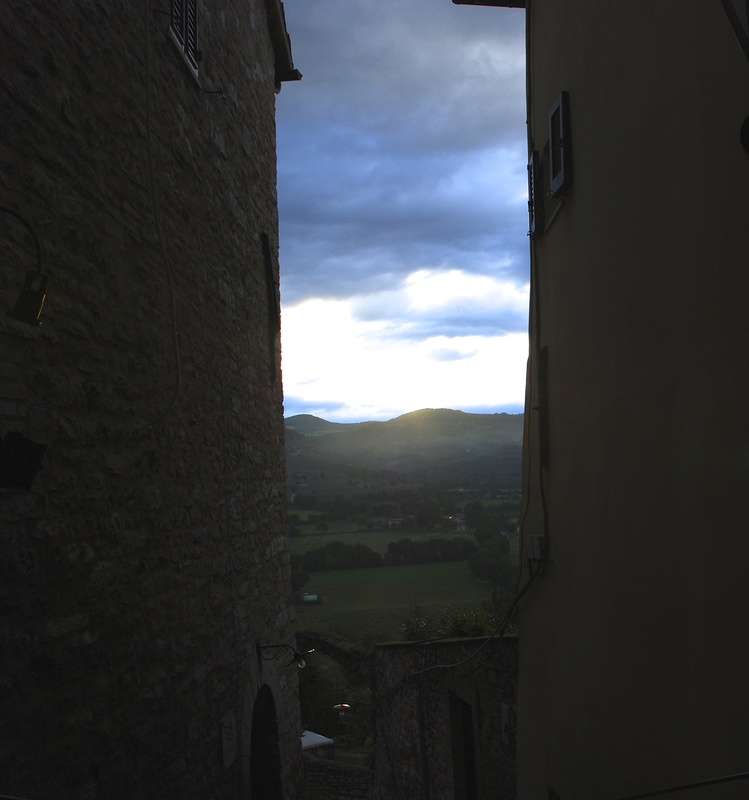 Those in the tiny alleys are long and narrow…. They follow the contours of the streets…. 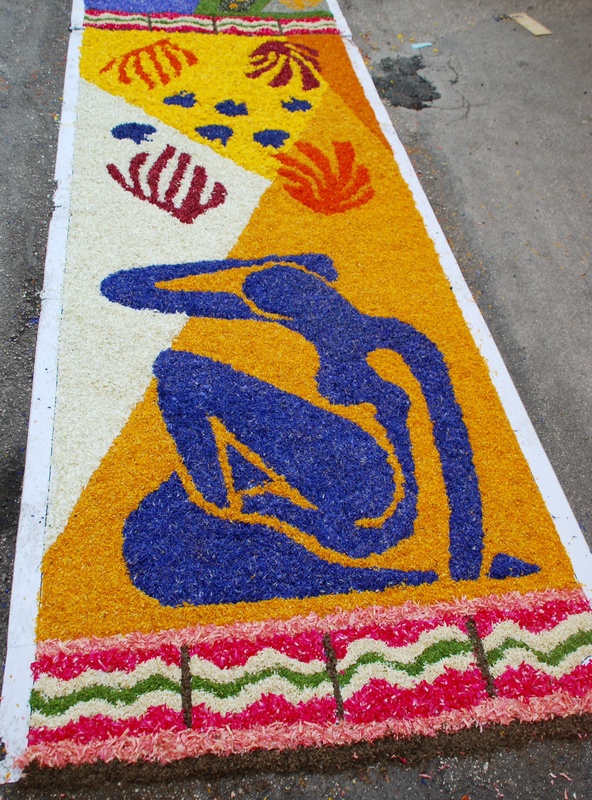 This one was clearly inspired by Matisse…. 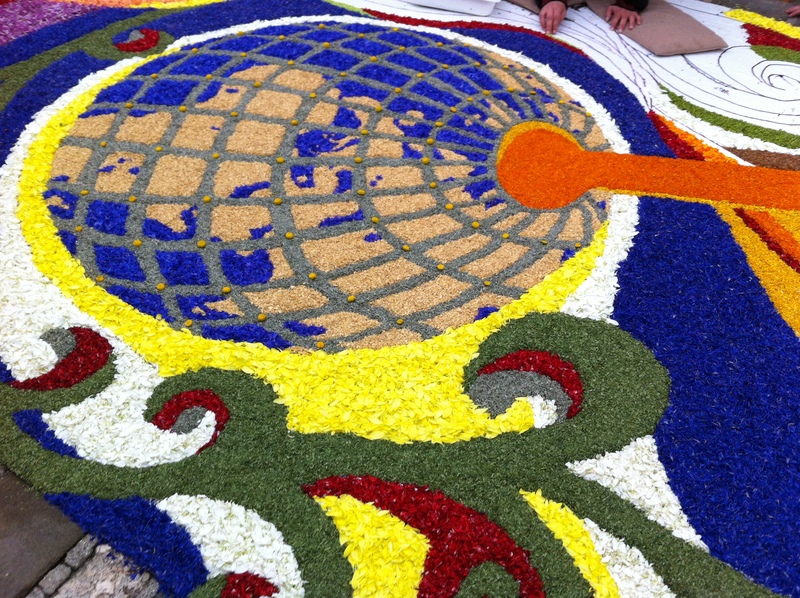 In the squares, the pictures were spread over a larger area…. 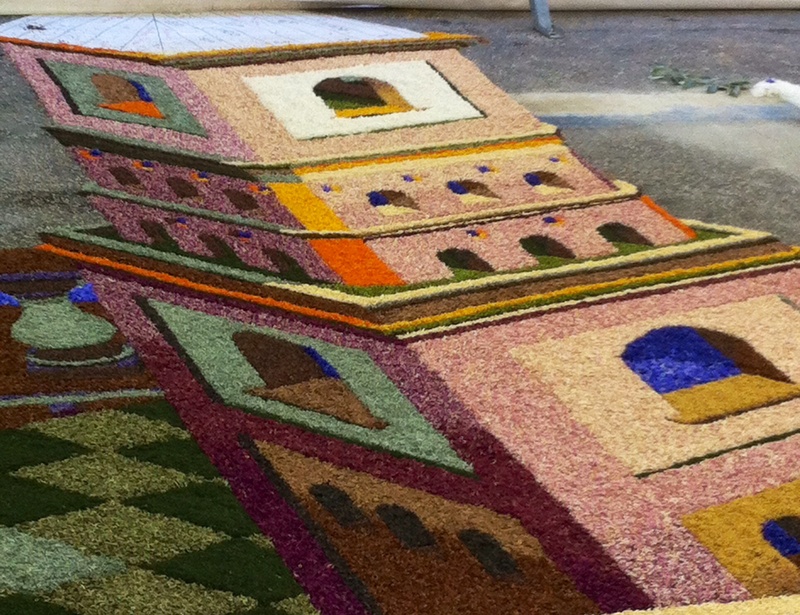 It is hard to believe that these detailed flower carpets are created using only leaves, flower petals, herbs and seeds. 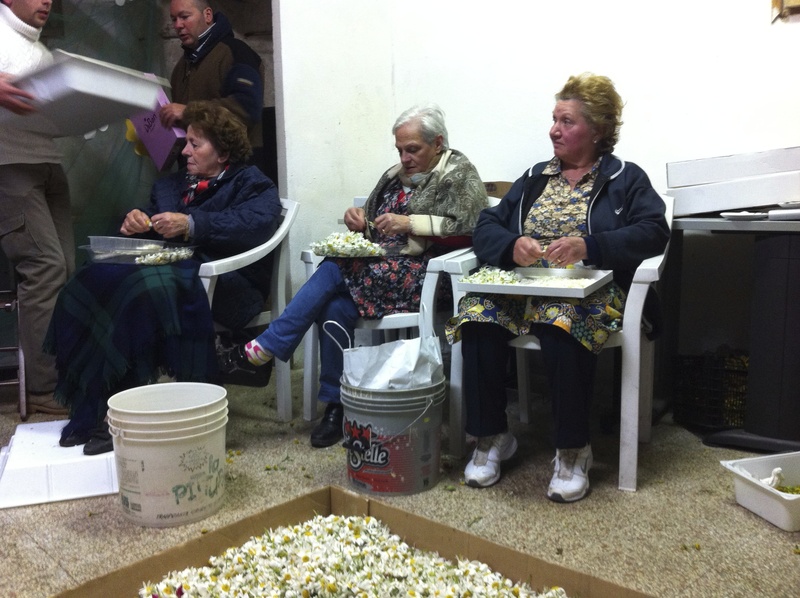 But they are; last year we were fortunate enough to be involved with the production of one of these masterpieces, picking flowers out in the fields and on the mountainside. When you look closely you can see how the layers of colour are built up. Here ballet dancers pirouette across the street, under a scroll of musical notes…. Saint Francis of Assisi was a popular subject this year; Assisi is just a few miles away and, in addition, the Pope adopted the name of Francis in remembrance of this Saint who was dedicated to the poor. 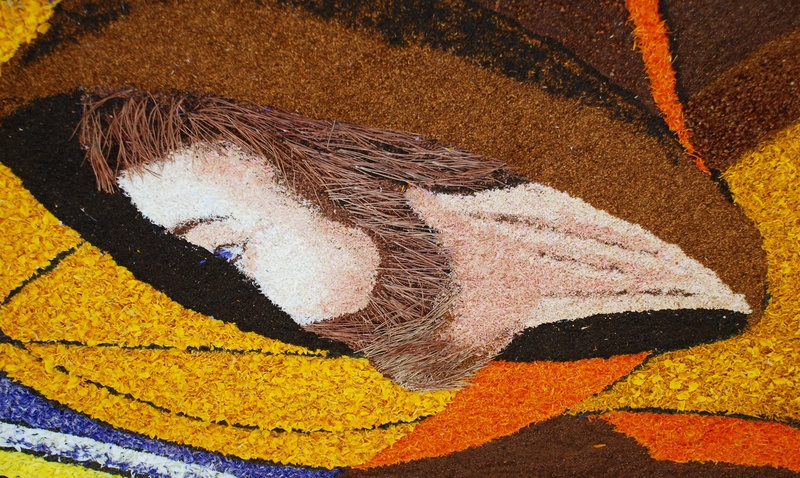 See how Saint Francis’ beard has been created, texture added with tiny twigs…. Most of the pictures have a religious theme. 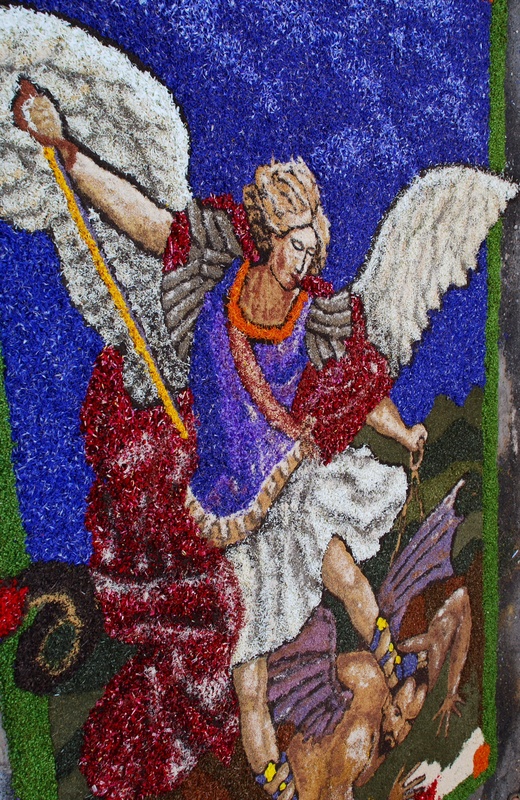 One of my favourites showed the Archangel Michael smiting the devil. Look at the devil’s face – the detail is incredible. 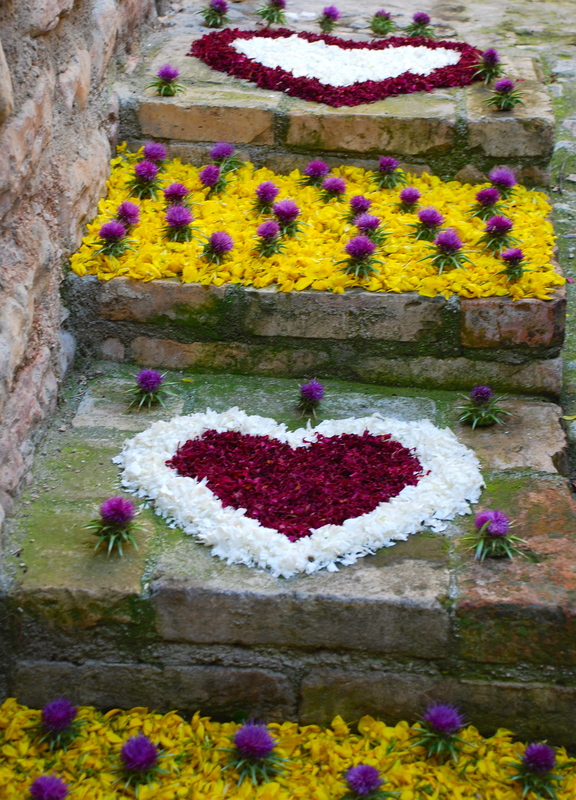 Pictures are created by teams of people, largely from Spello. 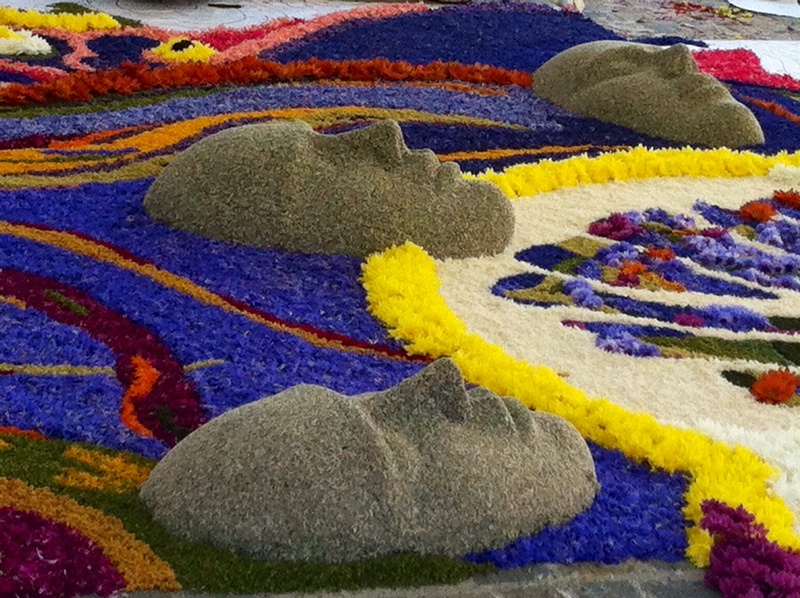 For weeks before the event, they pick flowers, grind dried petals and collect seeds and herbs. 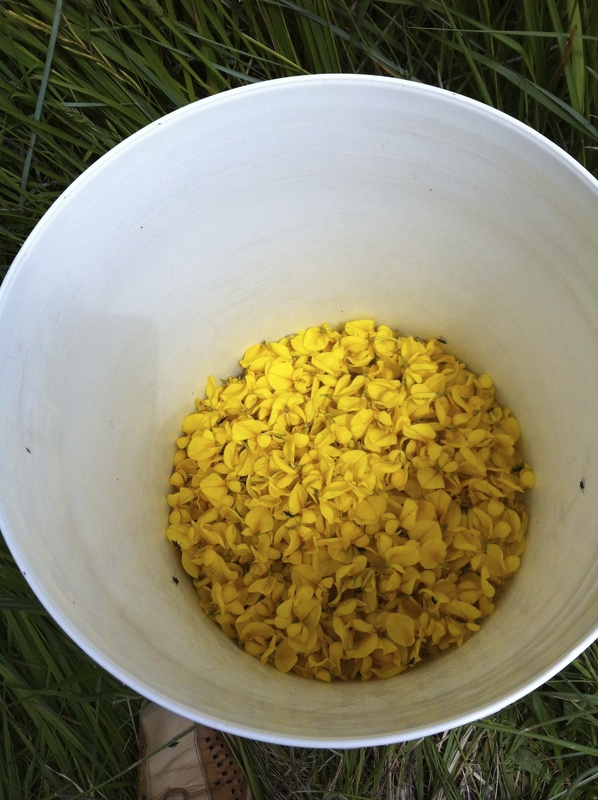 In the final hours, fresh flower petals are gathered. The designs are kept secret until the last possible moment as there is a competitive element. There are several different categories, including one for the under 14 age group. Just look at what they produced…. 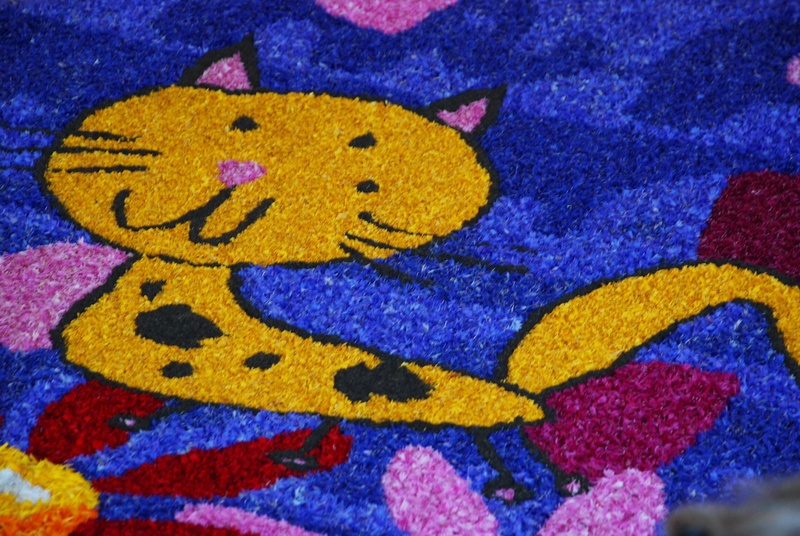 Designs are either drawn in chalk on the road surface or sketched on a paper sheet which is then stuck to the ground. 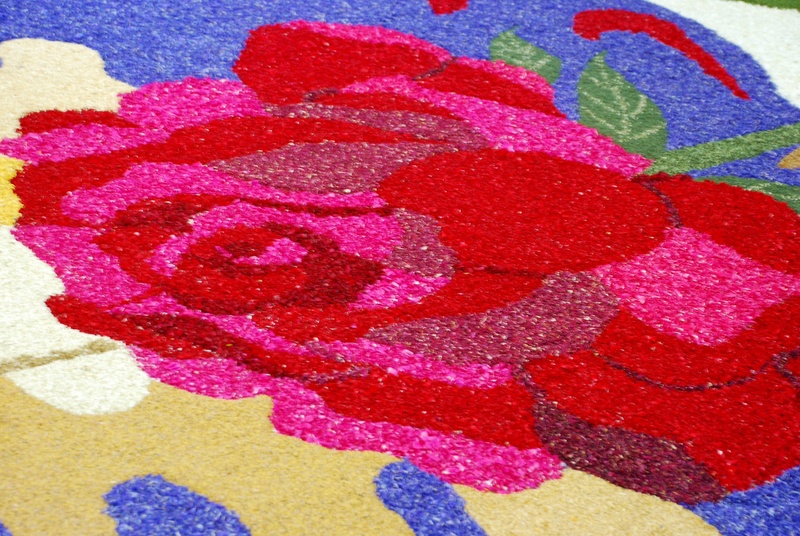 Other than that, no glue is allowed – all of the flowers and seeds are placed directly onto the surface. The way in which faces are portrayed is particularly fascinating. See how this eye seems to look straight at you…. This entwined couple had eyes only for each other…. 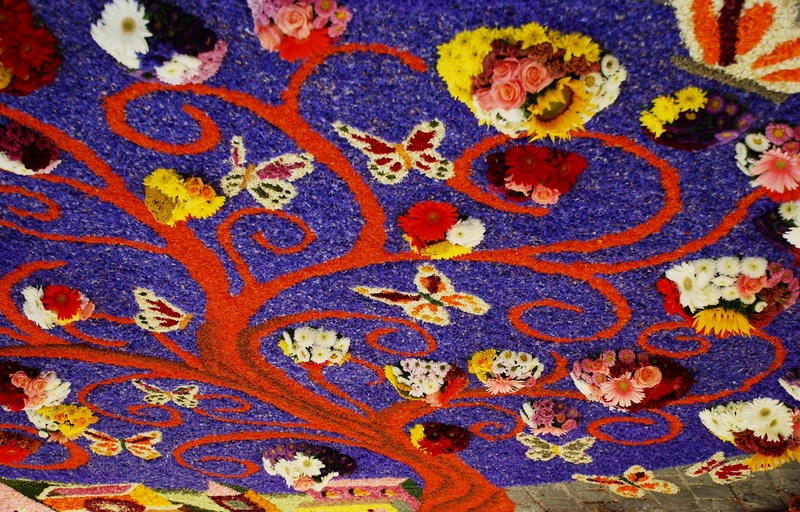 A colourful tree had three dimensional leaves and butterflies…. In this depiction of the Garden of Gethsemane, the leaves of the olive tree were placed right side up and then inverted to look like leaves rippling in the breeze…. The work on the pictures starts on Saturday afternoon. People work all night under arc lamps swung across the streets. By 8 o’clock the following morning, everything is completed. Crowds had already started to arrive as the final touches were added. This peacock was pleased as punch with his colourful feathers…. ….whilst these sleeping beauties were oblivious to the noise of the crowds! ….and towers bathed in moonlight…. Tiny people gathered under arches…. Even the local digger was decorated for the celebrations! 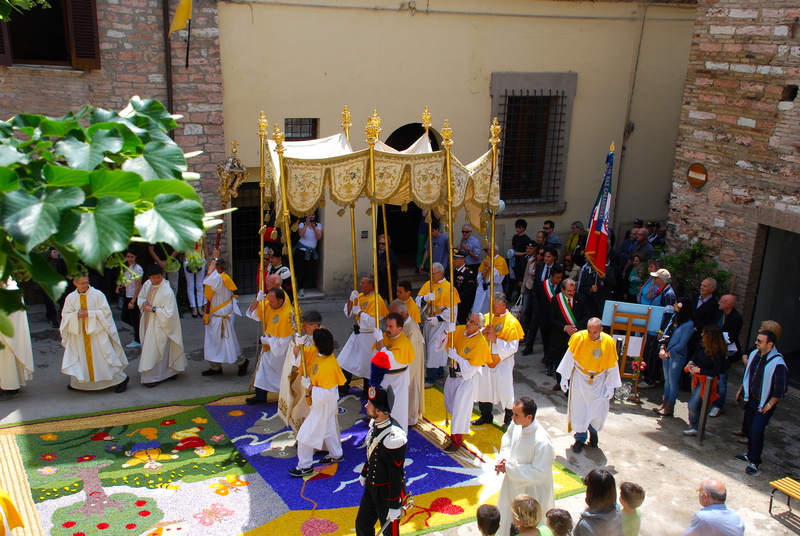 At around 11 o’clock on Sunday morning there was a procession through the streets. 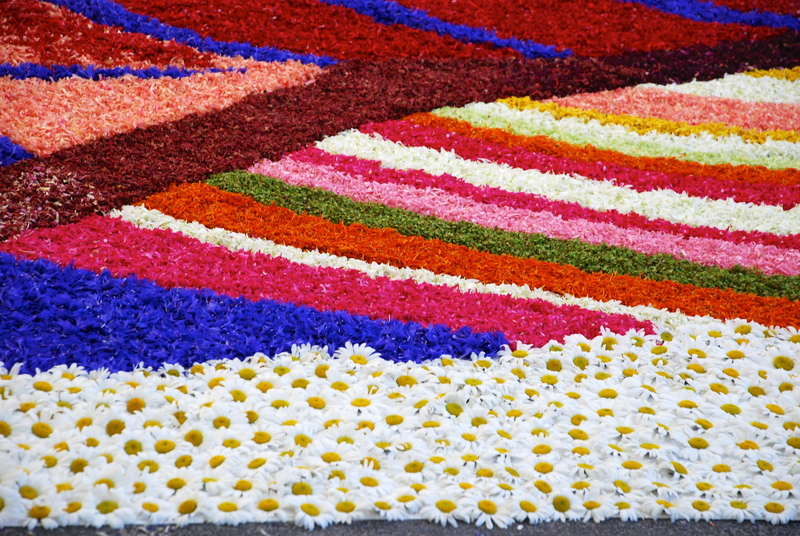 By Sunday evening, all of the flowers have been washed from the streets. 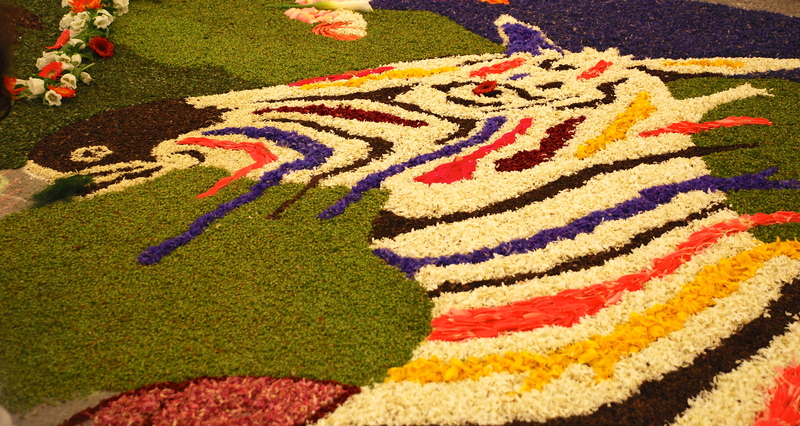 The transient nature of the wonderful floral creations only adds to their interest. 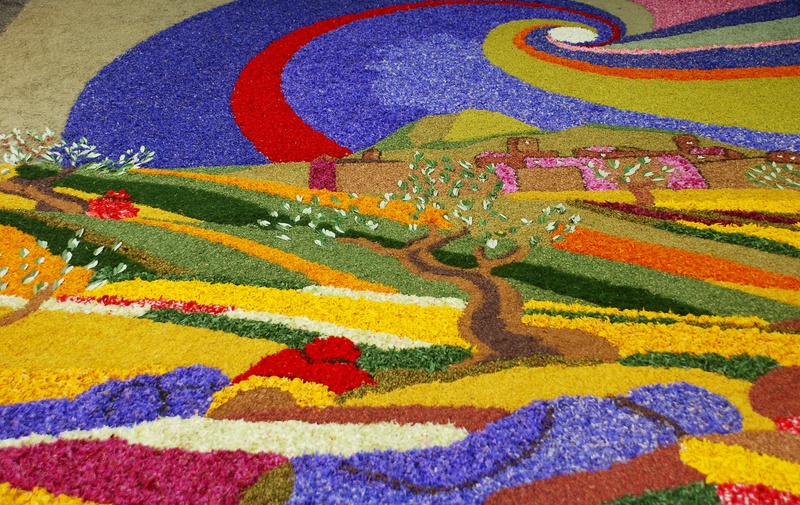 Spello’s Infiorata is a truly unique experience. 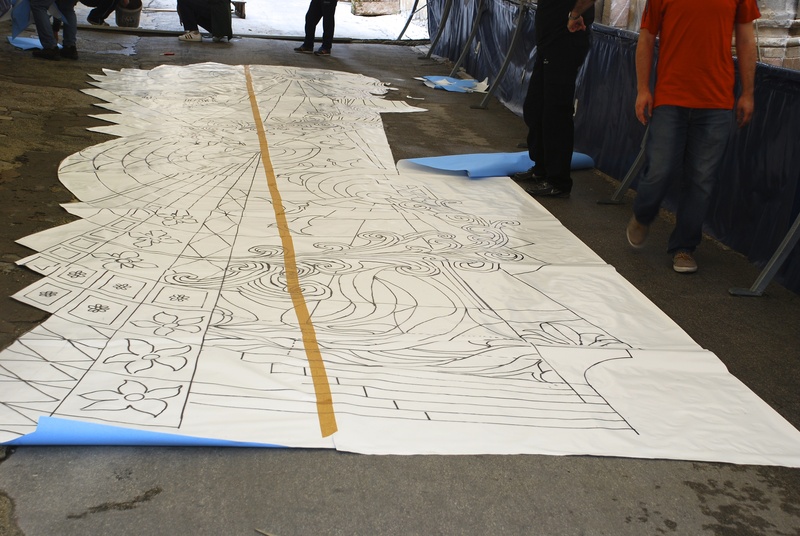 For more details of the preparations for the festival and photos of last year’s creations, click on the link below. 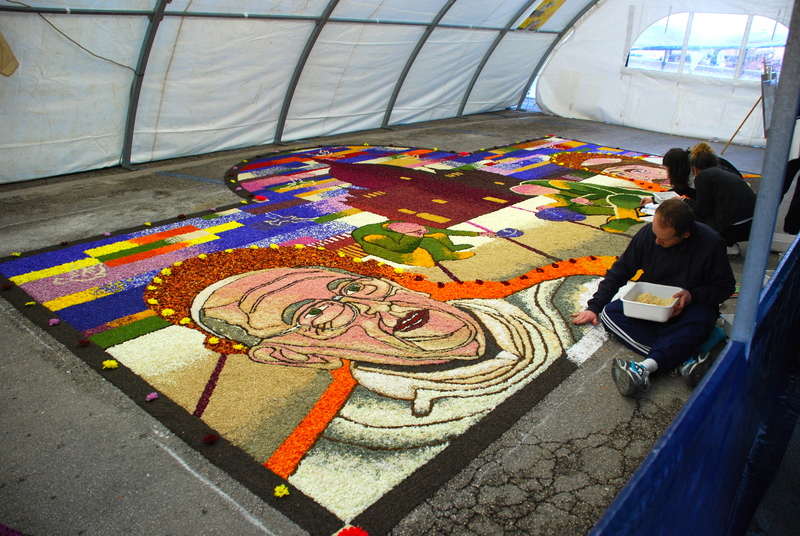 This entry was posted in Italian Life, Nature, Photography, Spello Festivals, Travel, Umbrian Hill Towns and tagged Corpus Christi, Corpus Domini, Floral pictures, Infiorata, Saint Francis of Assisi, Spello, Spello Infiorata 2014 on June 25, 2014 by maryshoobridge. 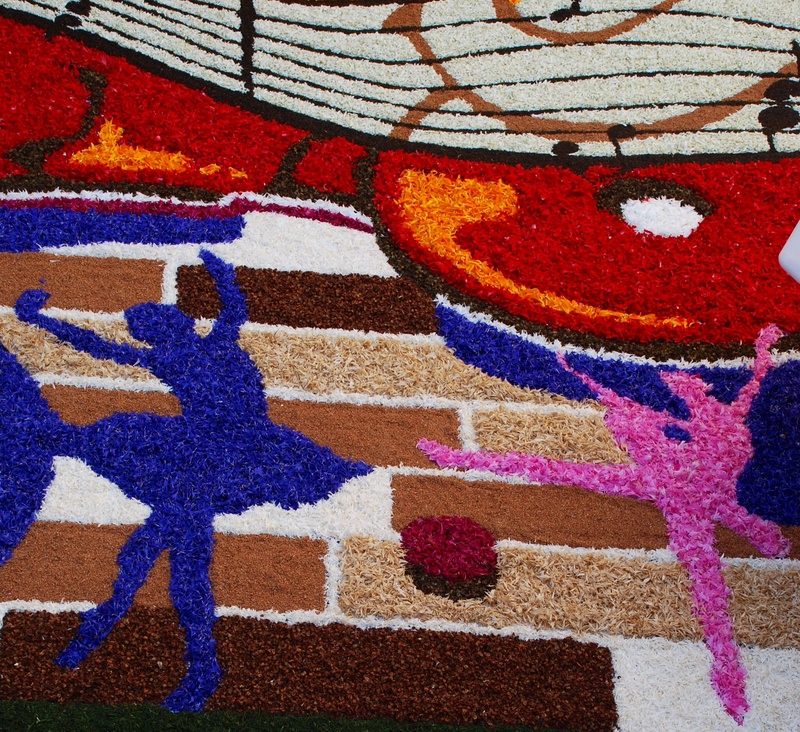 Spello’s biggest festival – the Infiorata – takes place this weekend. 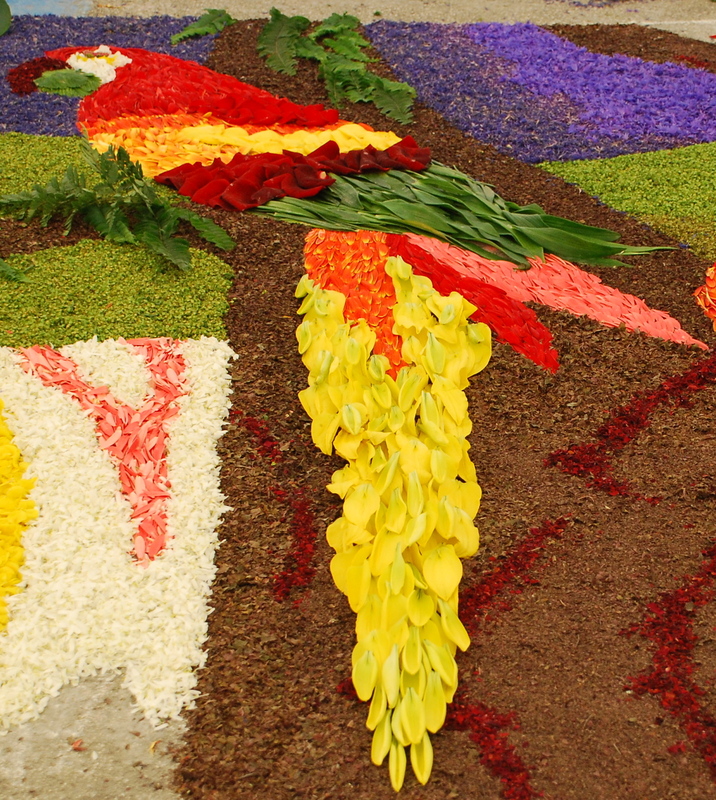 It marks the celebration of the Catholic feast of Corpus Christi which this year falls on June 22. The link below will take you to my post a year ago which described the preparations for the festival and had lots of photos of last year’s event. 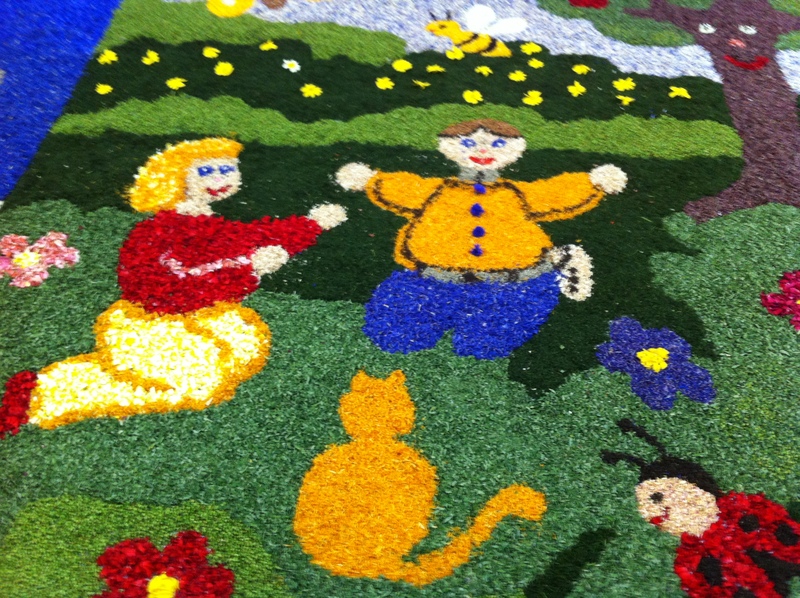 I will write about this year’s Infiorata after the weekend. 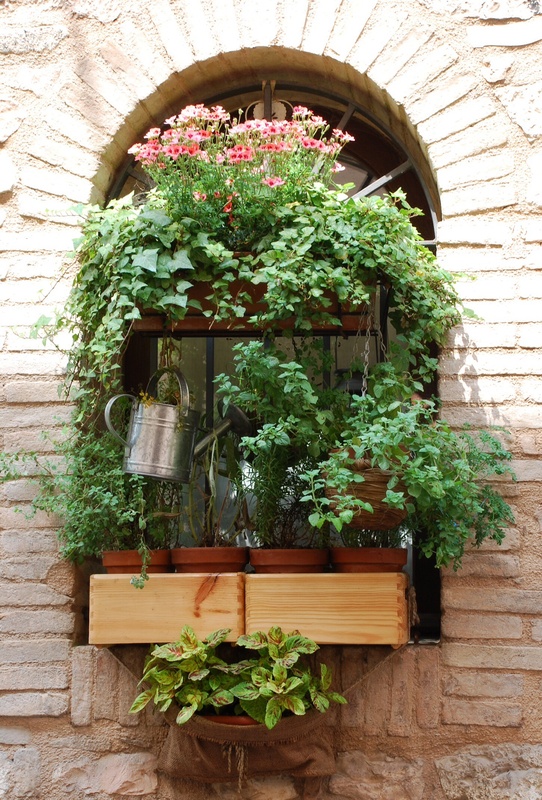 But now every window box, every alleyway and every corner is bright with flowers in preparation for the celebration. 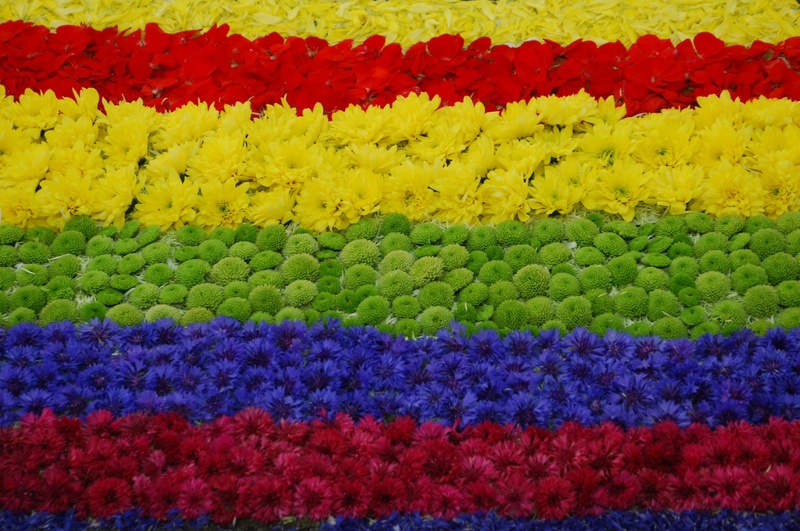 Walk with me around the streets and enjoy some of the beautiful flowers, rainbow bright…. 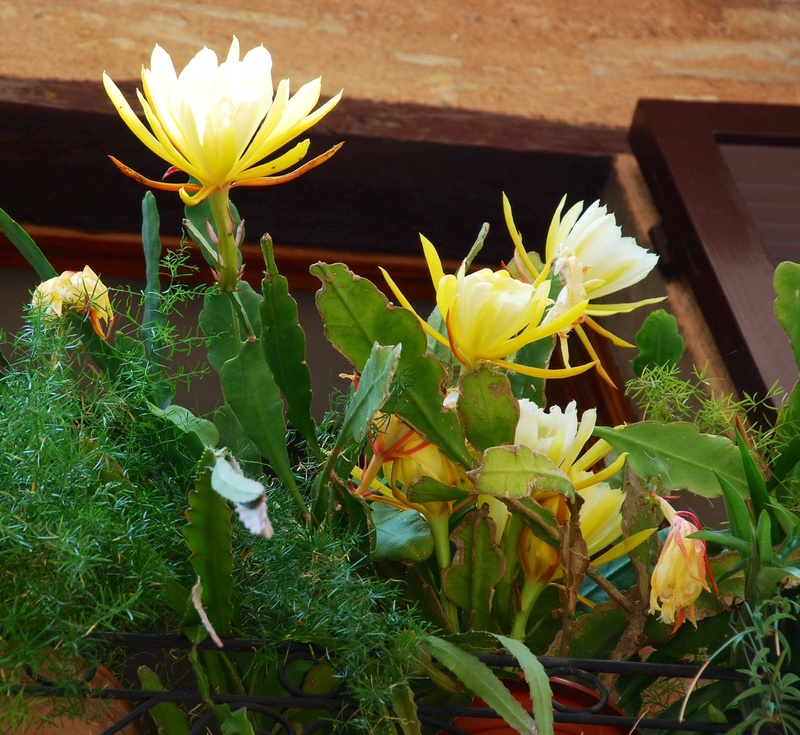 ….huge cacti flowers bursting into bloom, reaching for the sunlight…. 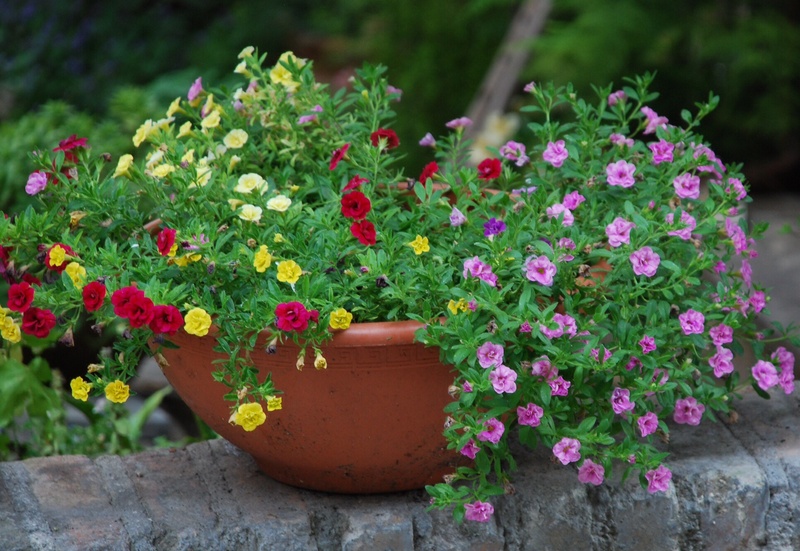 ….bowls of tiny blossoms, a mass of colours…. 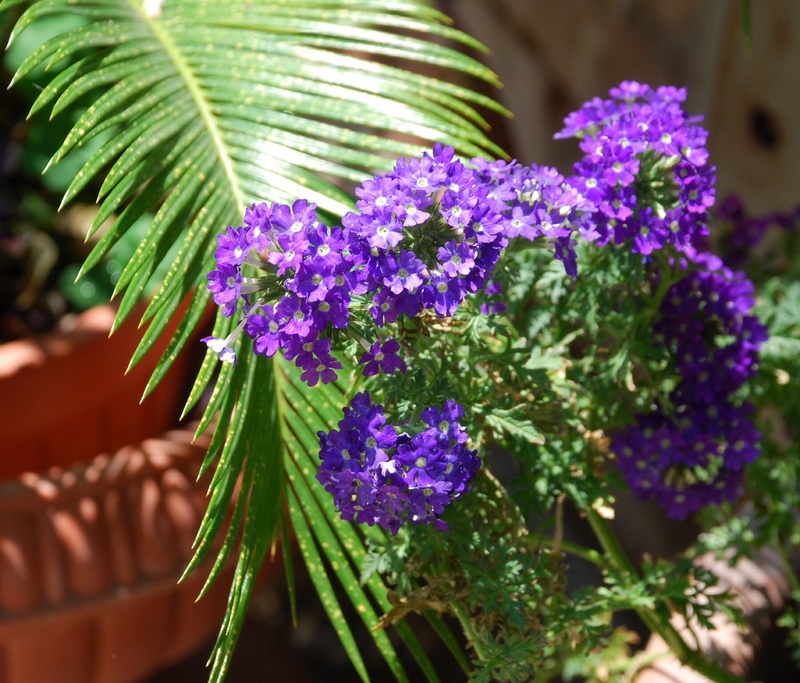 ….and vibrant purple against a green palm…. 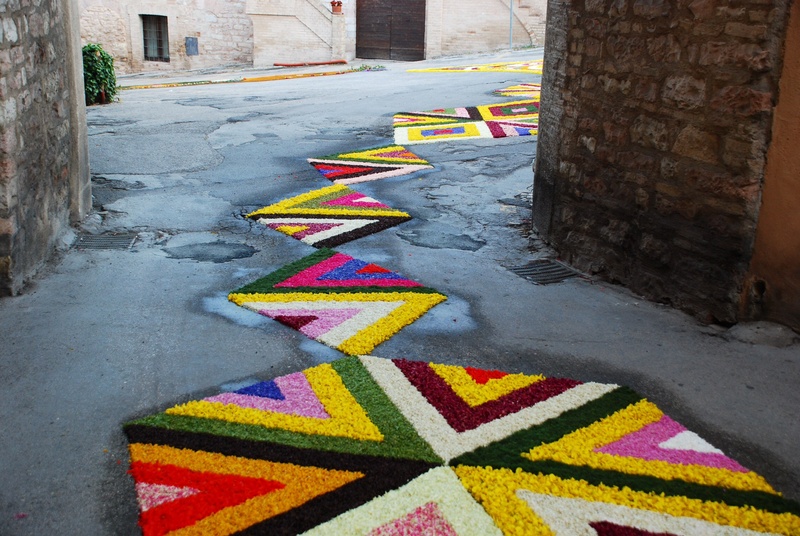 Let’s hope the sun keeps shining as the beautiful carpets of flowers are laid in Spello’s streets, squares and alleyways. Prepare yourself to be amazed by these exquisite creations in my next post. 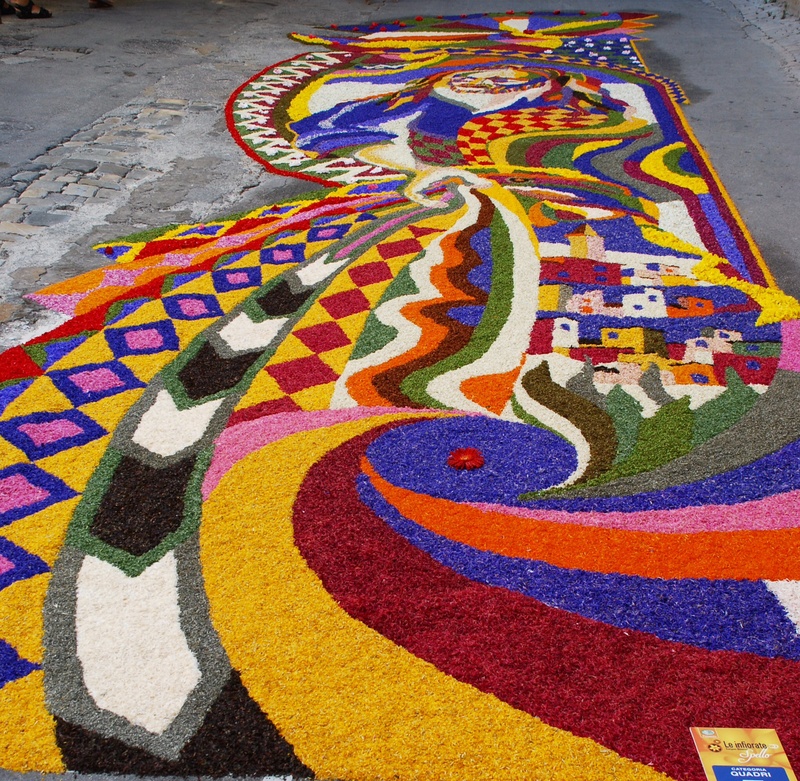 This entry was posted in Italian Life, Photography, Spello Festivals, Umbrian Hill Towns and tagged Corpus Christi, Infiorata, Spello, Spello festivals on June 21, 2014 by maryshoobridge. 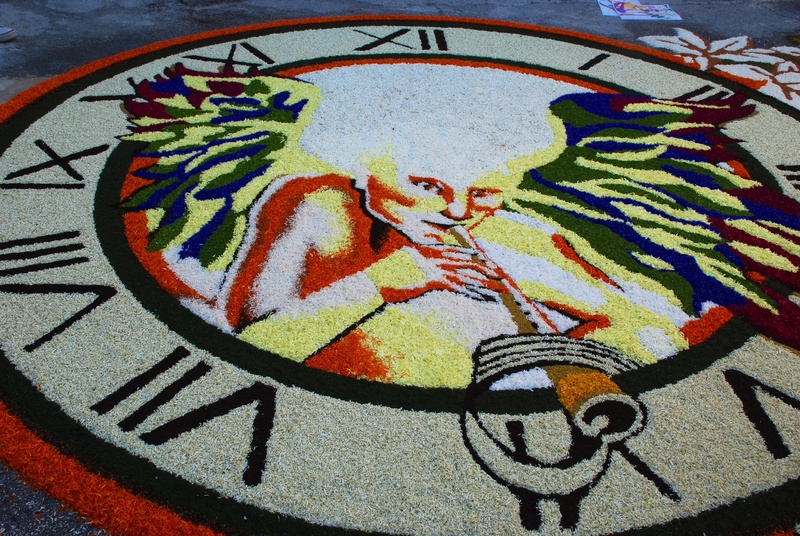 Spello’s most important festival, the Infiorata, takes place on the feast of Corpus Christi when Catholics celebrate the tradition of the body and blood of Christ. 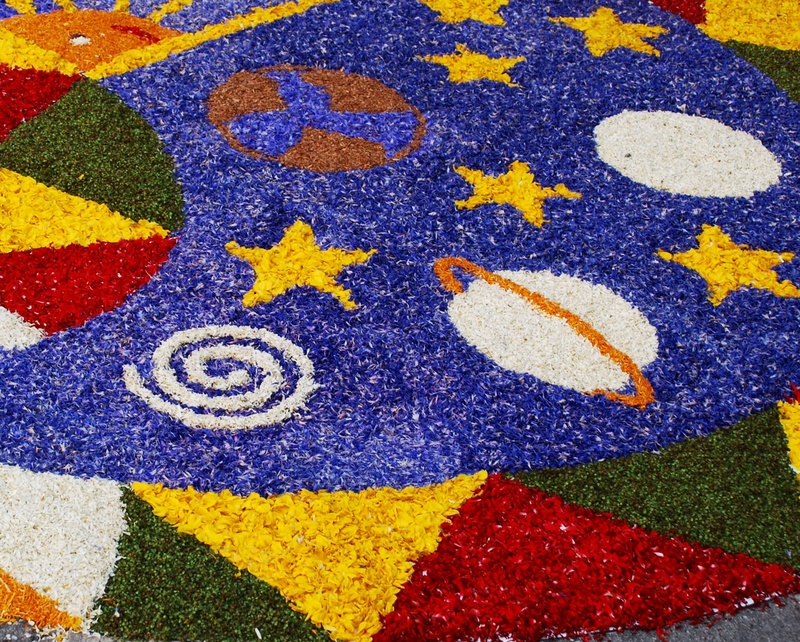 The citizens of Spello gather together to create magnificent pictures along the streets and squares of the old town, using only flower petals, leaves and herbs. 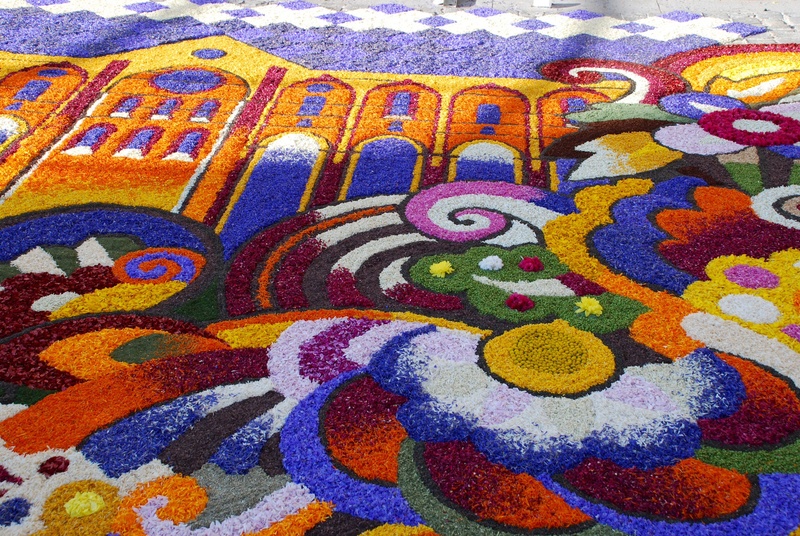 Spello’s festival is the biggest of its kind in the whole of Italy. 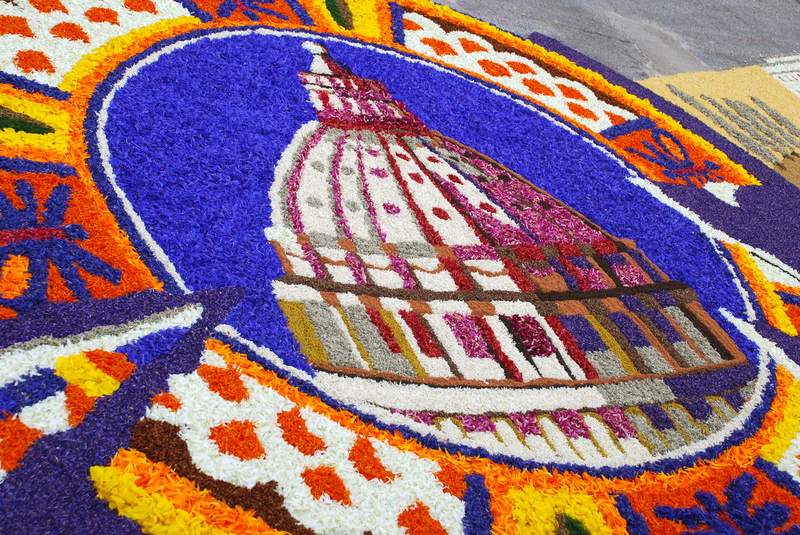 The tradition of floral celebrations may have its origins in Roman times when large numbers of scented petals were strewn before conquering generals. The feast of Flora, the Roman goddess of flowers, was also celebrated in May, when wreaths of flowers were worn in the hair. 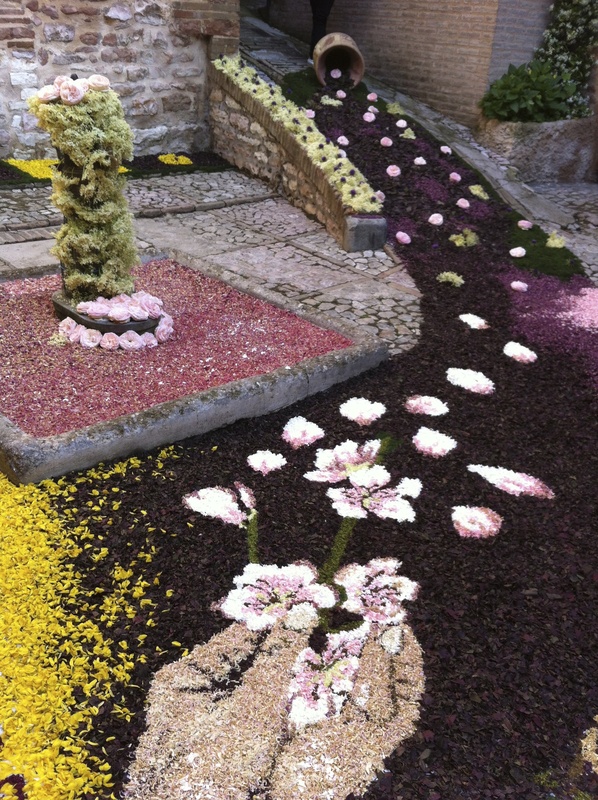 Records of floral carpets in Spello can be traced back to the early 19th century. 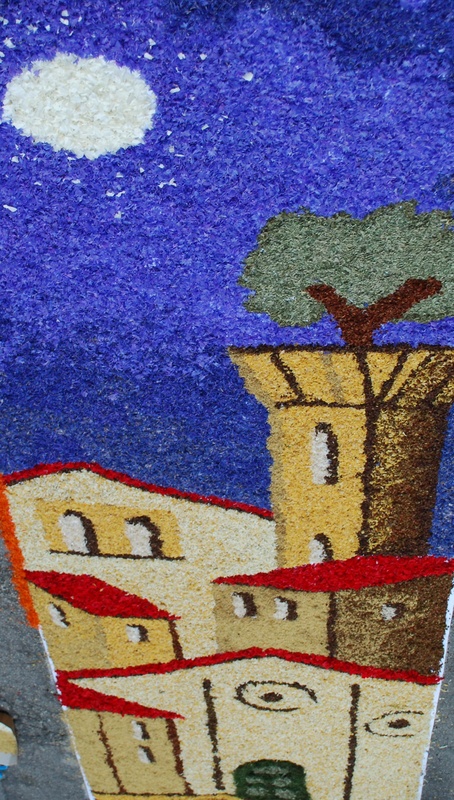 A painting by Benvenuto Crispoldi, artist and mayor of the town, depicts the Corpus Christi procession walking over flower carpets. 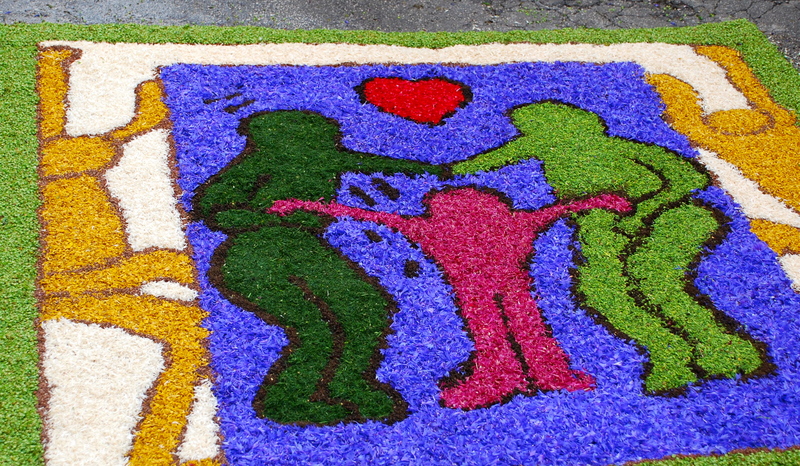 The form of the modern Infiorata came about when in 1930 a woman drew a figure in the street and decorated it with flowers and vegetables. 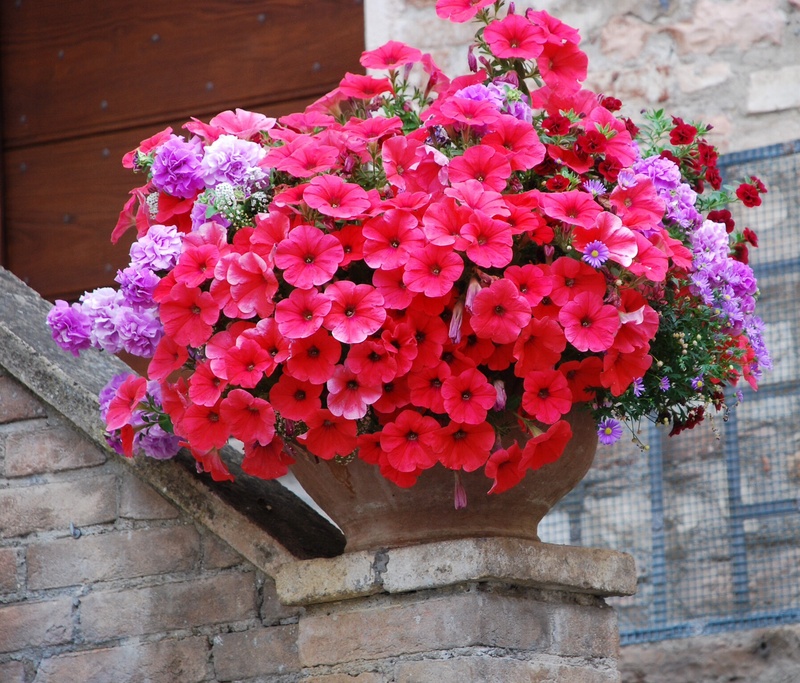 Since then, the people of Spello have challenged themselves to create more and more spectacular floral pictures. 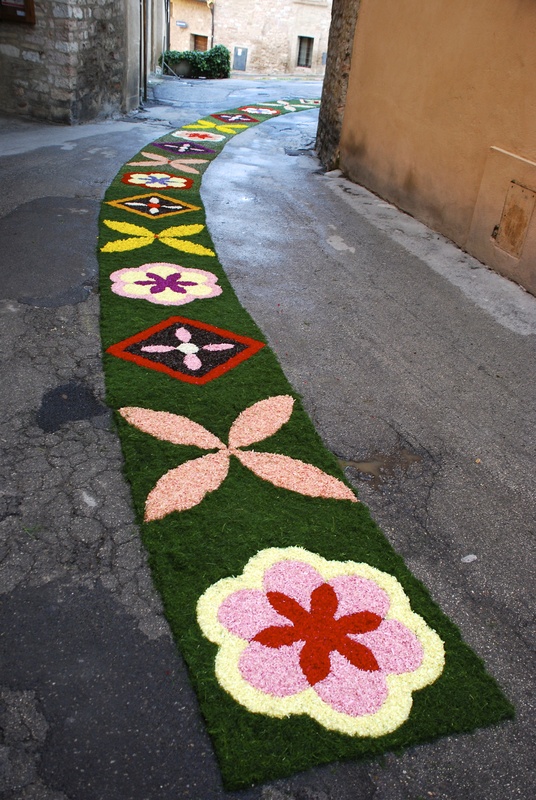 Around 2 kilometers of floral carpets are created by more than 40 groups of 5 or more residents in the streets and piazzas of the old town. There is a competitive element, so designs are kept strictly within the individual groups. There is a special category for under 14s, meaning that the tradition is passed down through the generations. Mio marito and I were keen to take part in the event and to contribute in a small way to our local group, the Piazzetta della Foglie, named after the tiny piazza where the group’s activities were based. 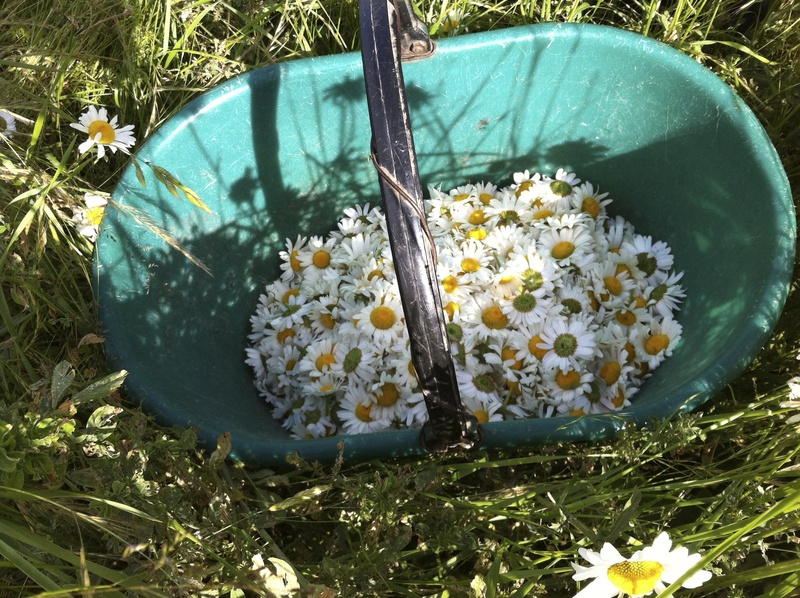 Collecting wild flowers to be dried was the first job. 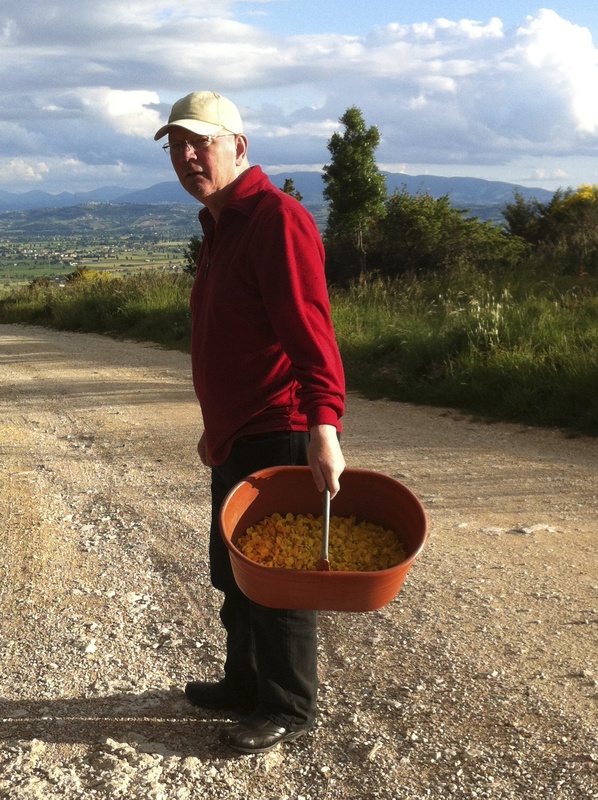 For several evenings we joined other colleagues to gather baskets of flowers from the surrounding countryside. On our first outing we drove around the local area searching for roses of a particular colour. 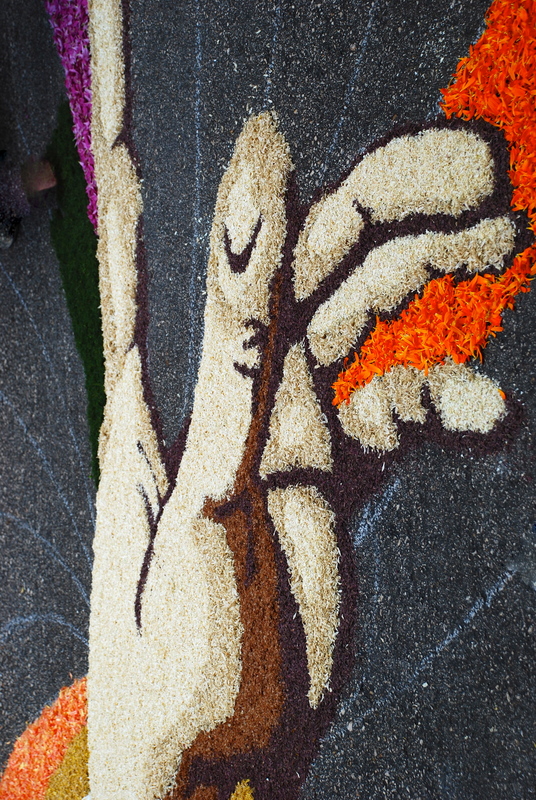 When the right roses were spotted, we screeched to a halt and asked the owners if we could take their blown roses for the Infiorata. Armed with thick gloves and secateurs it felt as though we were going equipped to steal, but without exception people welcomed us into their gardens to raid their rose petals. 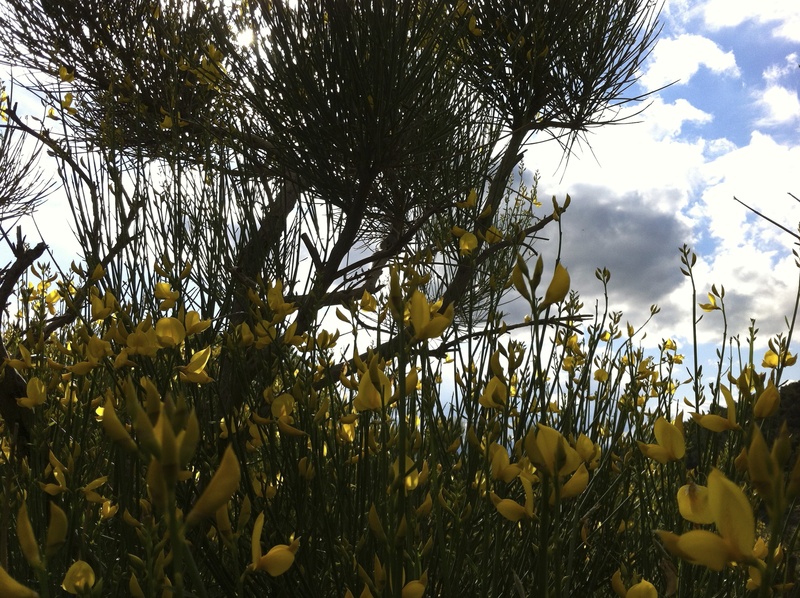 We picked bright yellow broom on the mountain slopes amid stunning scenery; we could see snow on the distant mountain tops. 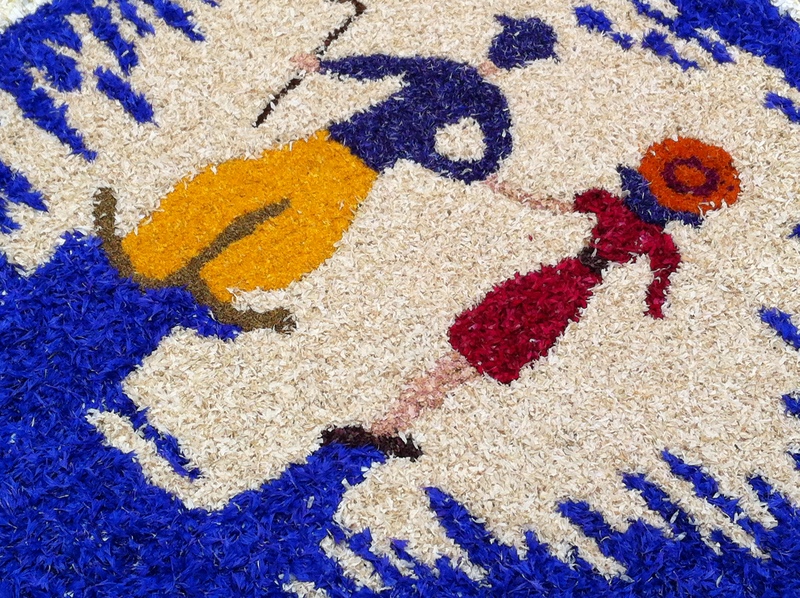 Spello Infiorata: Tired Flower Pickers! 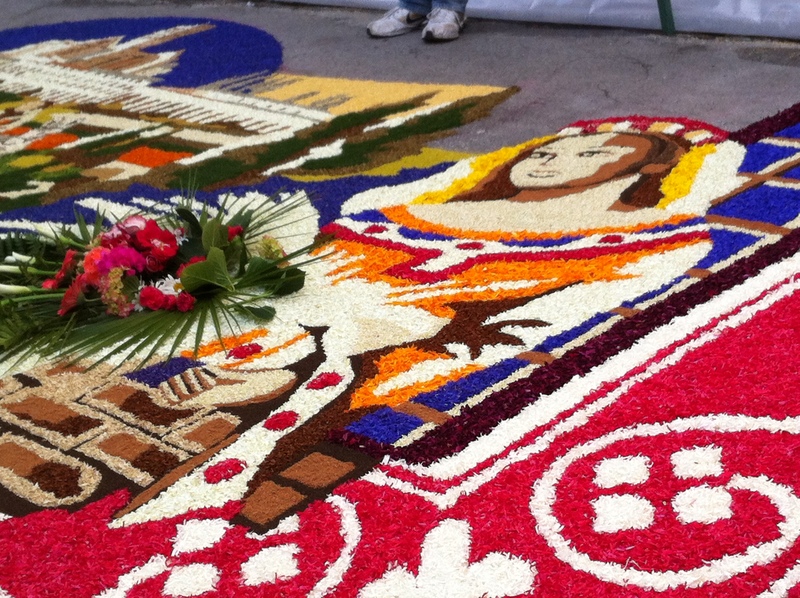 Spello Infiorata: Show us your flowers! 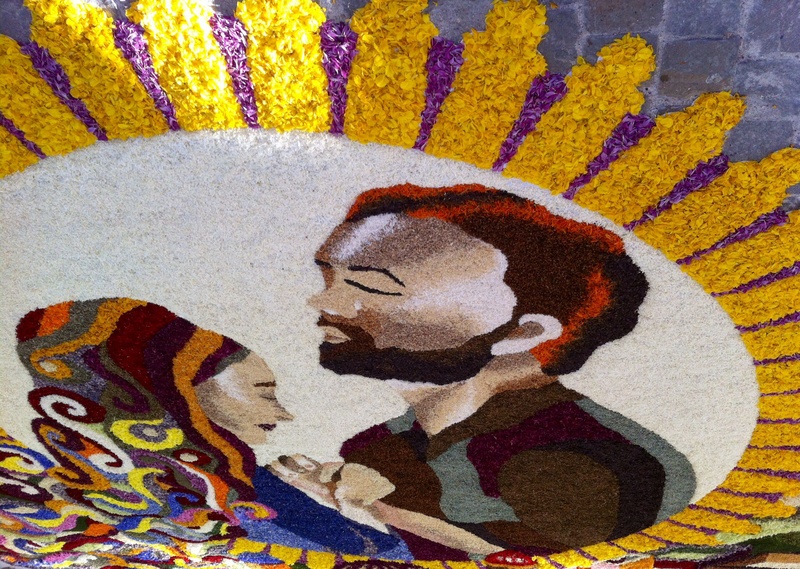 Spello Infiorata: Margaritas and passenger! 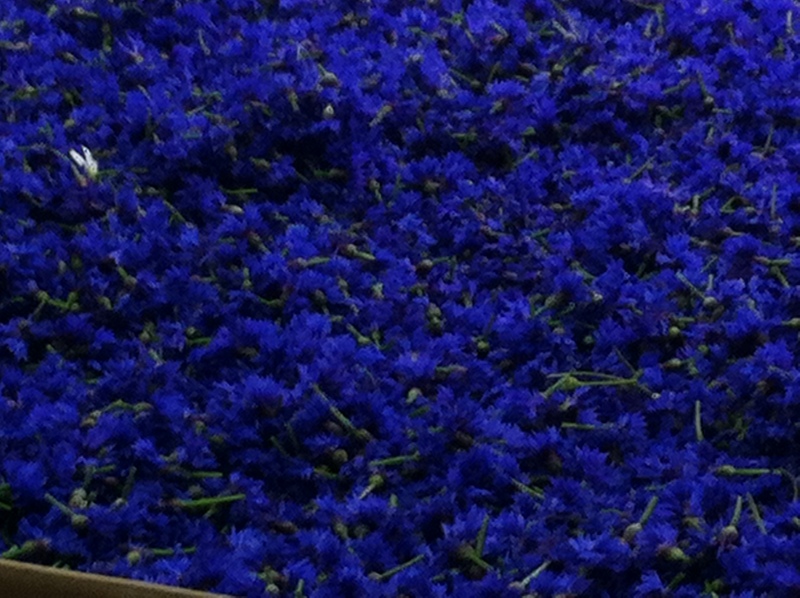 ….and splendid electric blue cornflowers on the great expanse of the high plains of Collefiorito in wet and muddy conditions. Others picked green foliage, seeds and herbs. 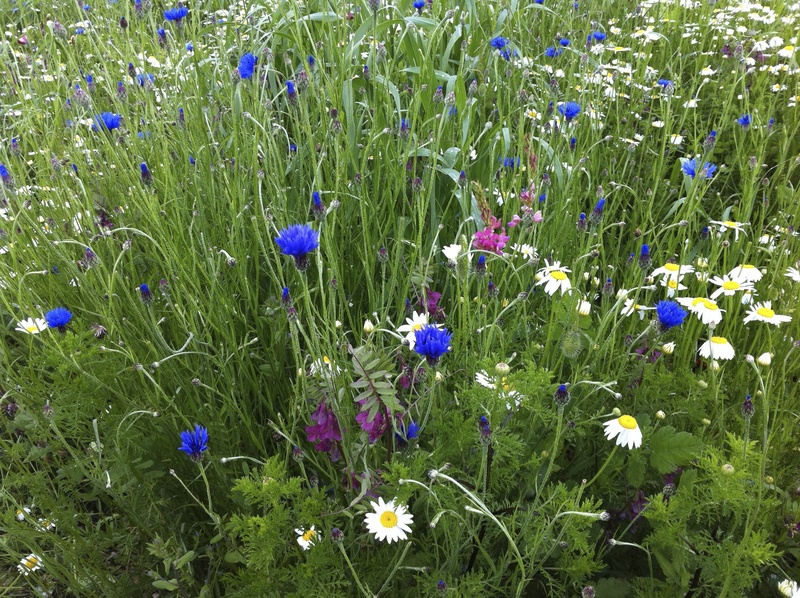 As the big day approached, fresh cornflowers and margaritas, foliage and fennel fronds were gathered, as fresh petals are brighter in colour than dried ones and produce a more pleasing design. 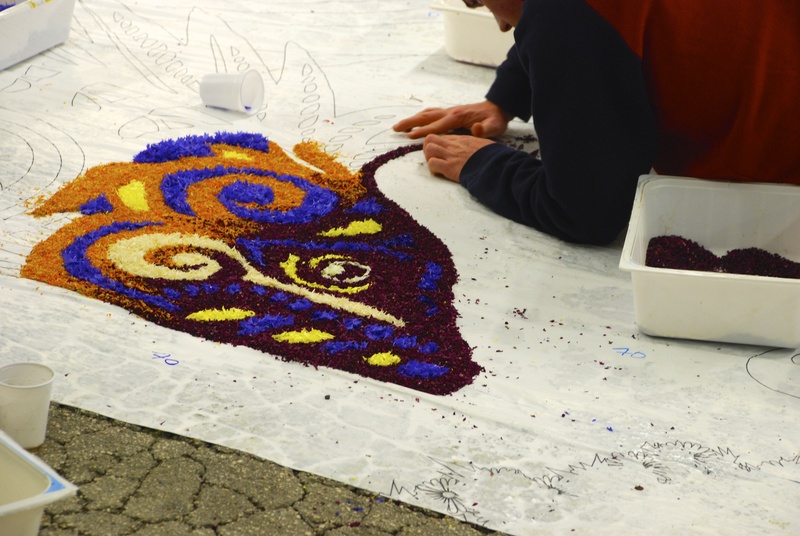 Groups of people picked the individual petals and separated the leaves, fronds and seeds. 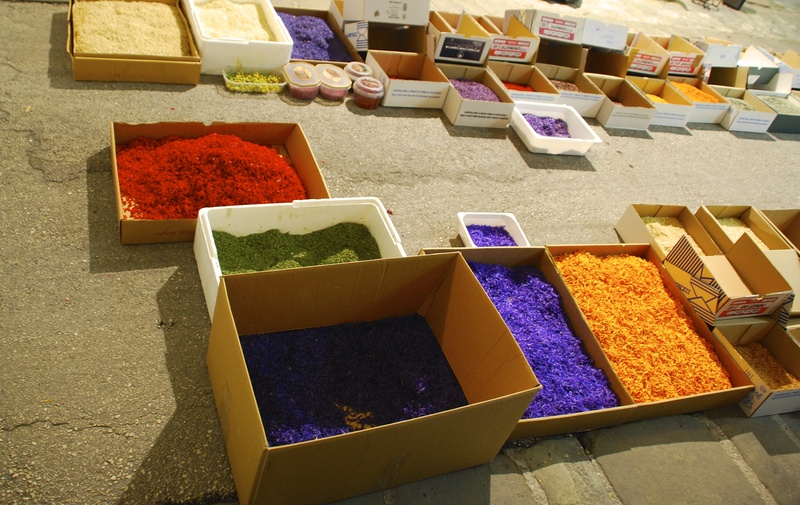 Petals were dried in the sun…..
…and then ground, producing an eye-catching display reminiscent of the spice markets of Marrakech. 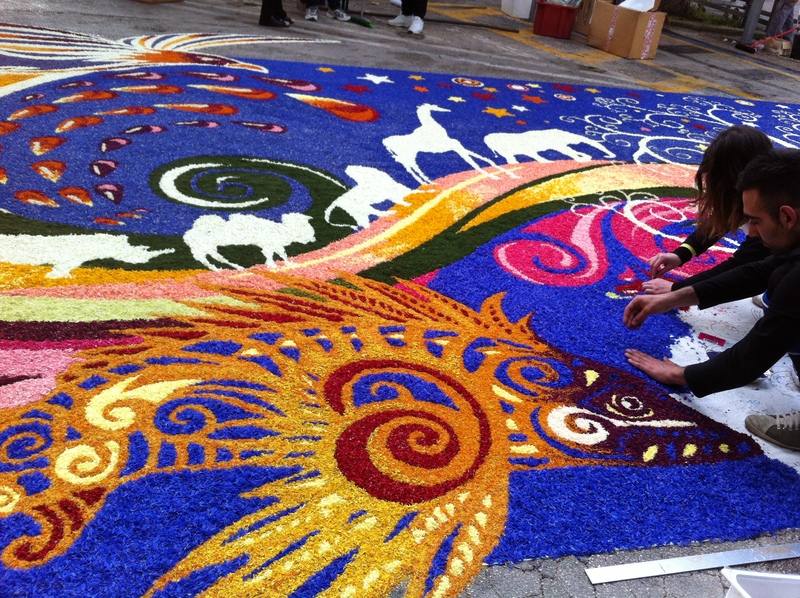 The Infiorati – those creating the carpets of flowers – either lay a paper design on the street or simply draw an outline in chalk. 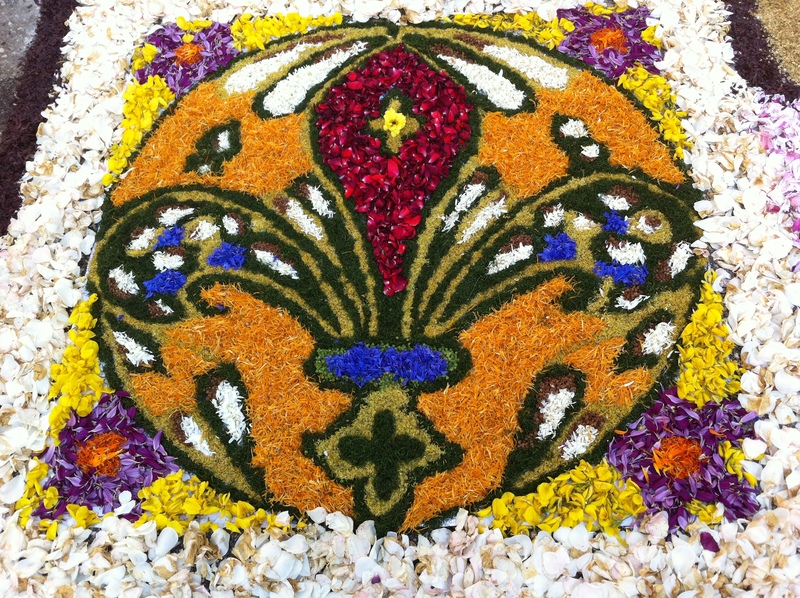 The Infiorati fill in the designs with their petals, leaves, seeds and herbs. Groups start on Saturday afternoon and have to complete by 8am on Sunday morning so they work throughout the night. For the larger areas, canopies and lighting are erected to protect the delicate work. 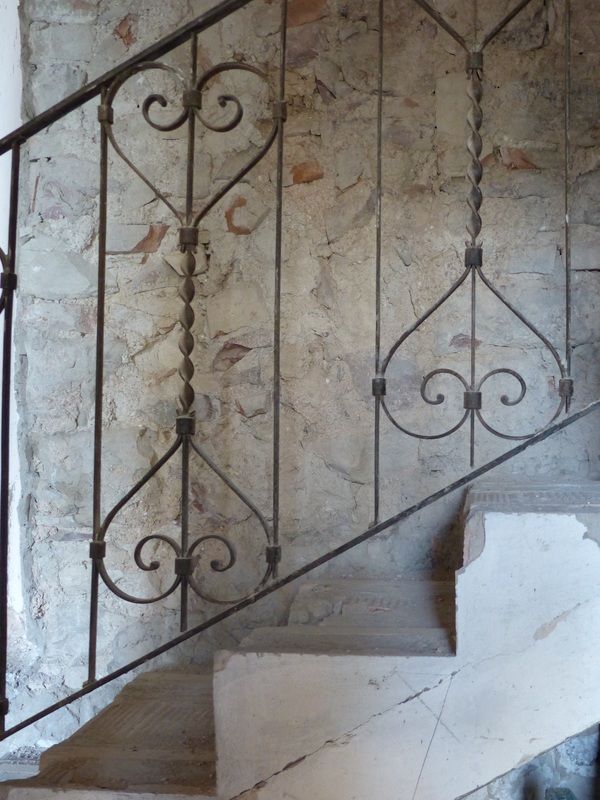 Unfortunately the designs in the narrow streets have no such protection. 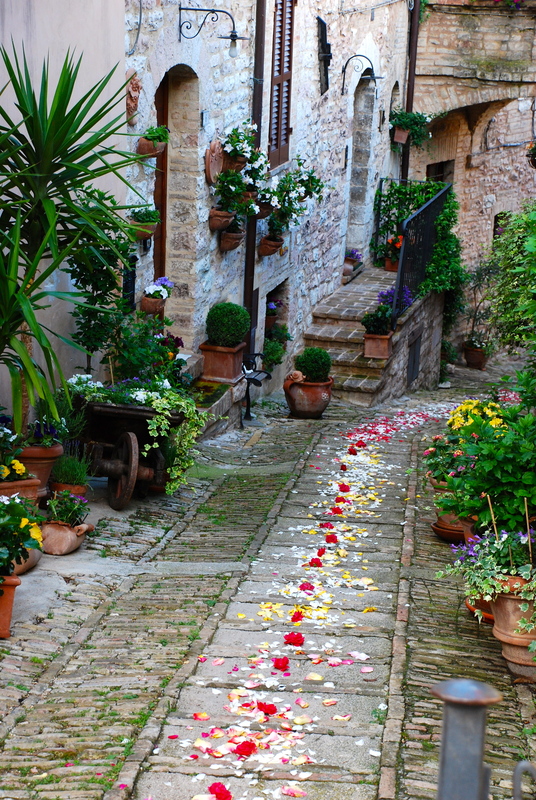 In the early hours of Sunday morning there was a torrential downpour of rain and many of the flowers were washed away. 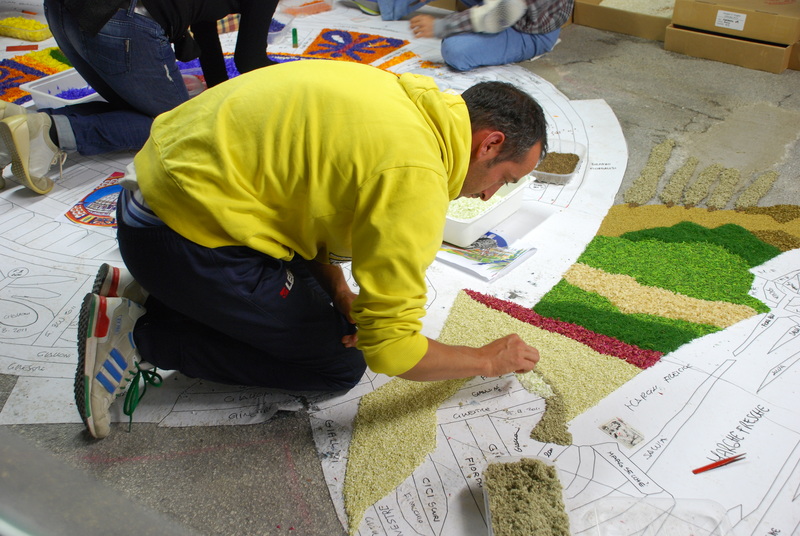 Most groups managed to restart their work, and in recognition of the weather conditions they were allowed an extra hour to finish. 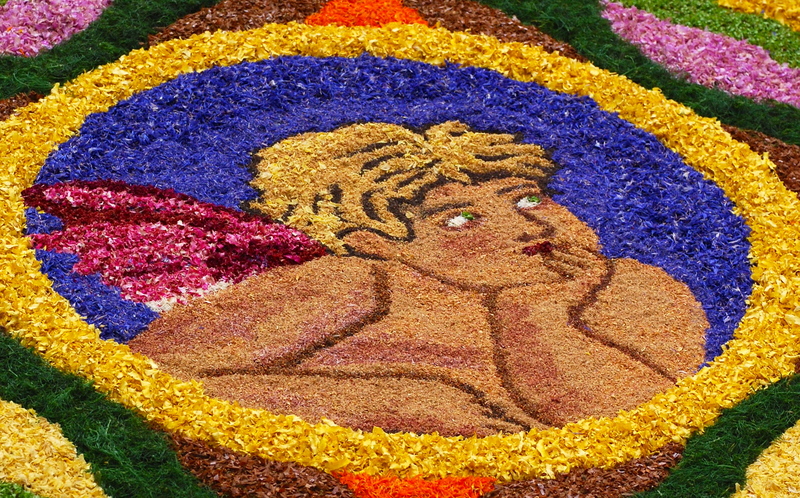 The enthusiasm and passion of everyone involved in preparing for and producing these sophisticated, scented masterpieces was really impressive. We rose before dawn to see the sunrise and to watch the final touches being added. Look at how the effect of grey hair and the realistic skin tones are achieved. 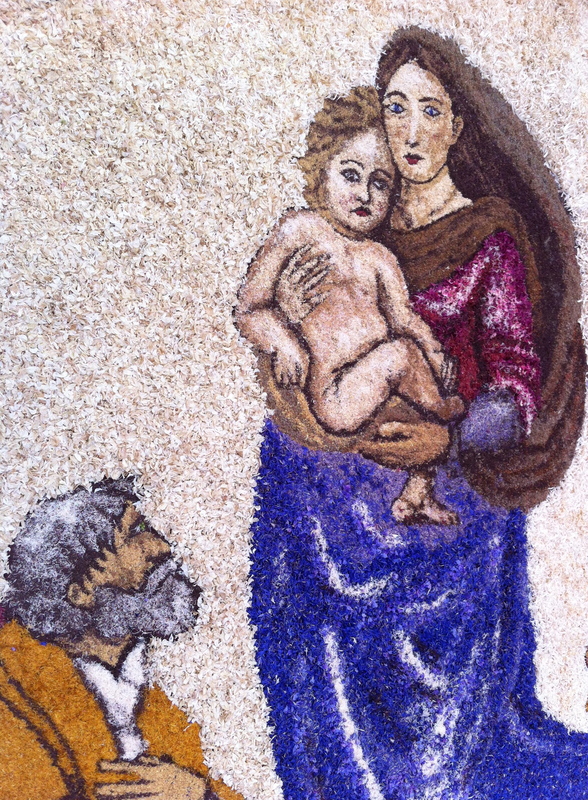 Spello Infiorata: The Holy Family. ……although there are also colourful geometric designs. 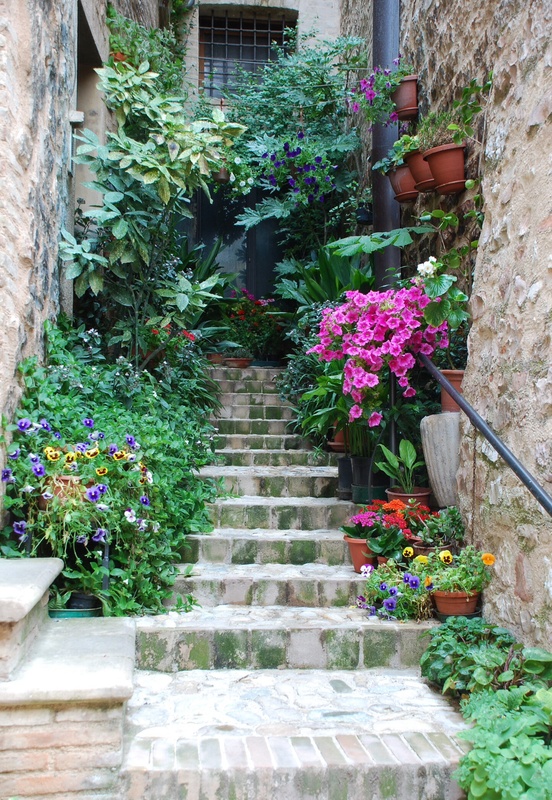 There are strict rules to be followed: large designs must cover 24 square metres whilst those in the narrow streets must be 12 square metres. 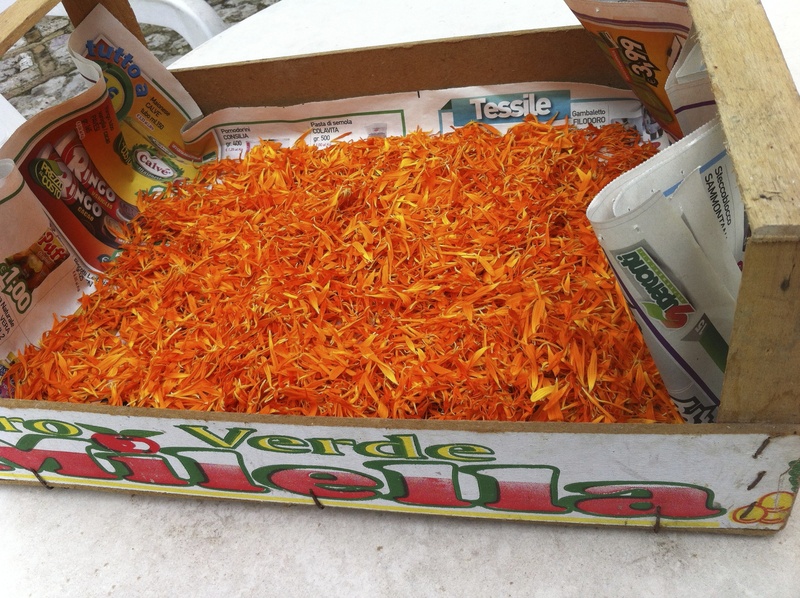 Flower petals – fresh or dried – foliage, herbs and seeds are the only materials. No glue is allowed. They prayed it would not be windy! 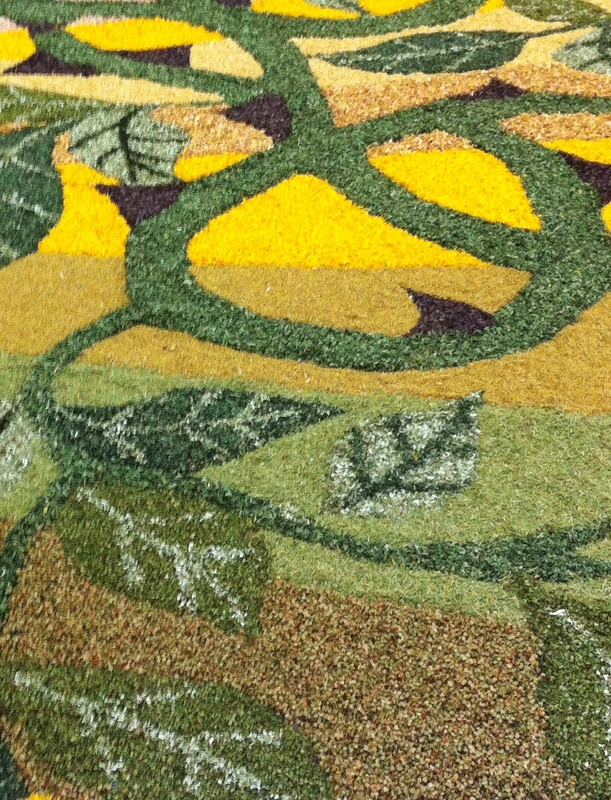 This was the carpet that mio marito and I made a small contribution to. Laid in our narrow street, it was in the form of a watch. 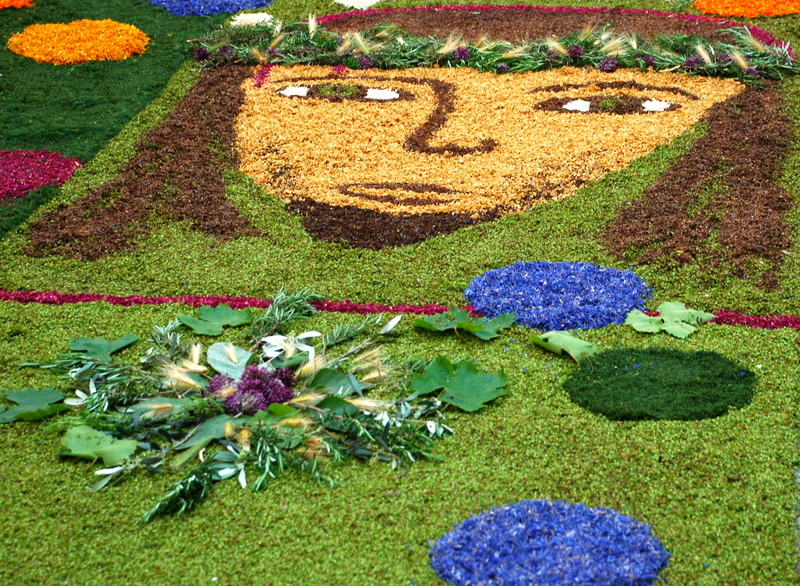 Individual segments illustrated points during the day and the watch face at the centre showed the face of Jesus in shadow. The message was one of prayer throughout the course of the ordinary day. The technical difficulty is apparent when you look at the detail of, for example, the clock on the wall and the filing cabinets. One of my favourites used the contours of the small square to wonderful effect. Even the water fountain was covered with flowers. 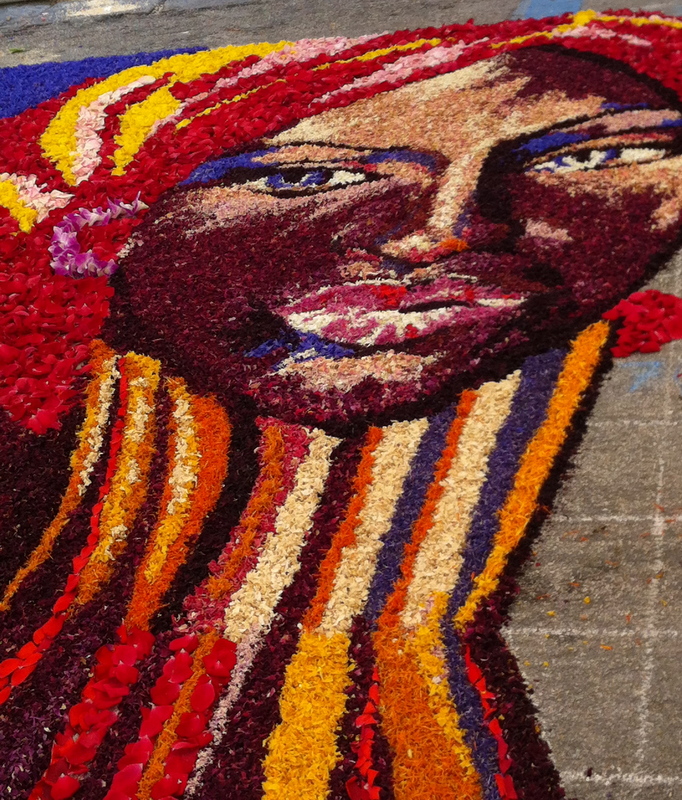 Different effects were produced by layering petals, giving pictures depth and texture. 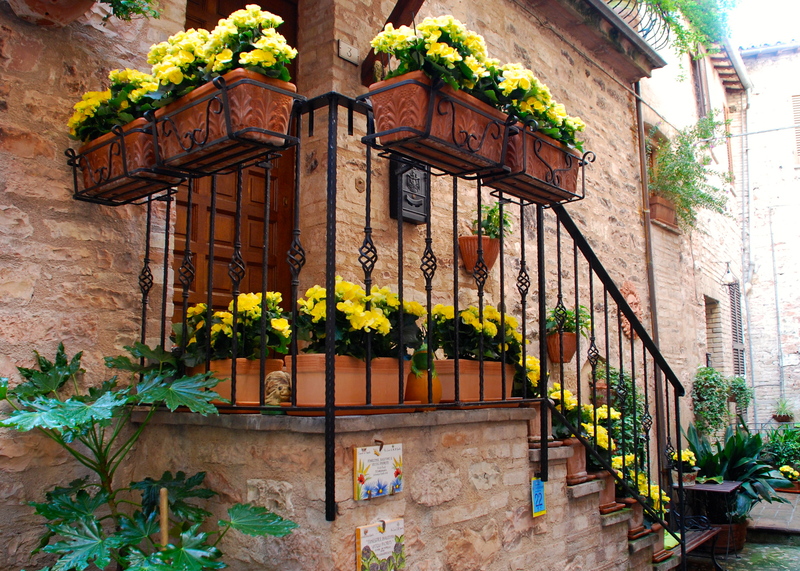 Bright colours and exquisite designs were all around the old town. 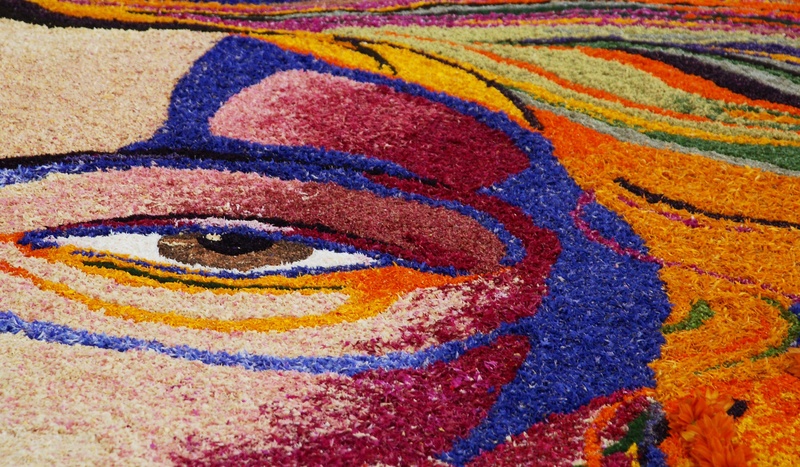 It is hard to believe that these pictures are created entirely with flowers; they look like beautiful paintings. 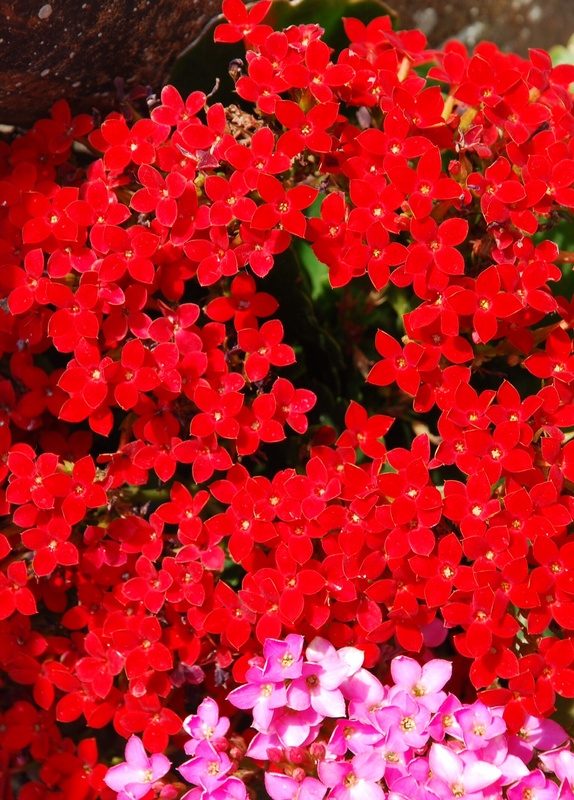 But look closely and you will see the individual petals. 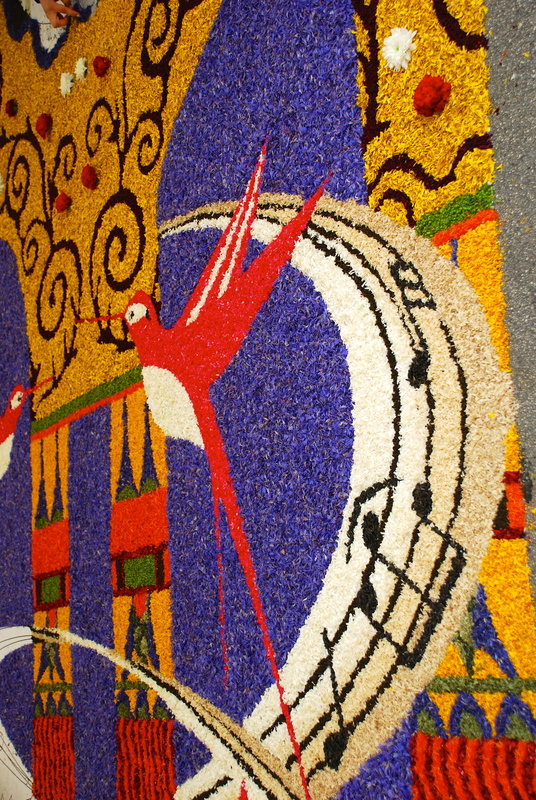 As well as the extravagant floral carpet displays, there are a number of other concurrent events, such as musical performances, competitions for the best floral cake design and the best flower-themed needlework and competitions for the most attractive window-boxes, balconies and alleyways. Even the restaurants serve food inspired by flowers. Despite the forecast, the weather was brilliant for the entire day. 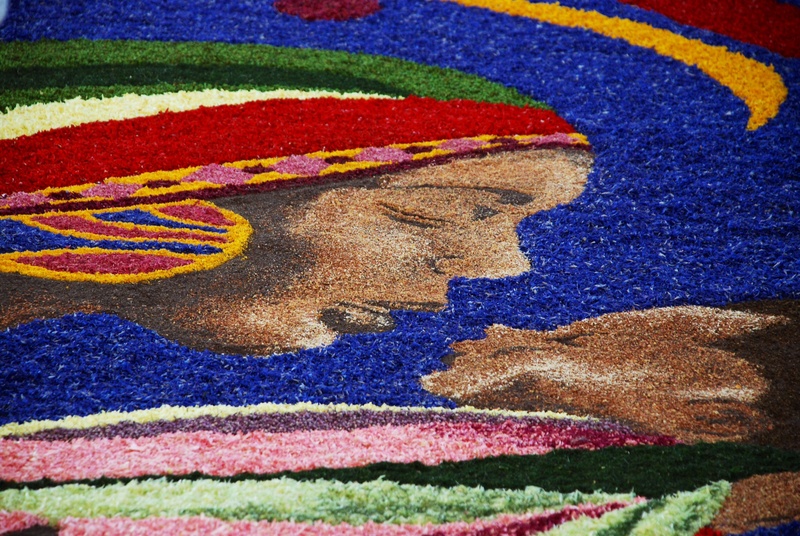 In 2012 there were 80,000 visitors to the Infiorata. I have no idea how many turned up this year, but turn up they did – in their droves. 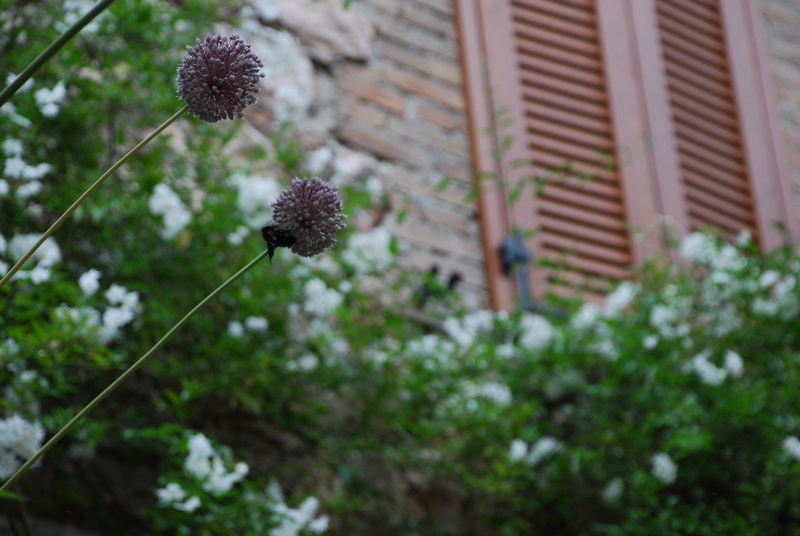 Tiny Spello hummed with their chatter and exclamations of delight! 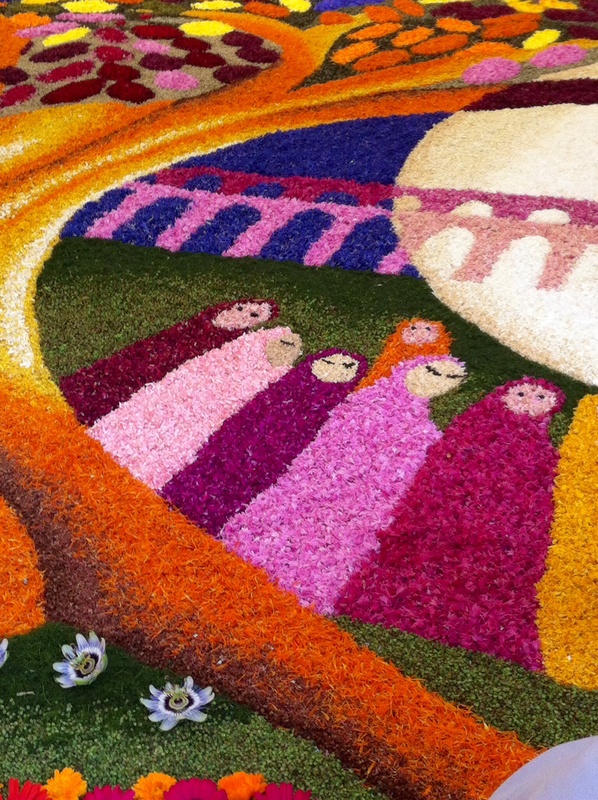 Spello Infiorata: Here comes the crowd! Coaches disgorged streams of happy visitors, cars queued to get in at the outskirts of the town and the people of Spello welcomed them all, free of charge. Bars that had stayed open throughout Saturday night to feed the Infiorati were still open on Sunday to refresh the travellers. 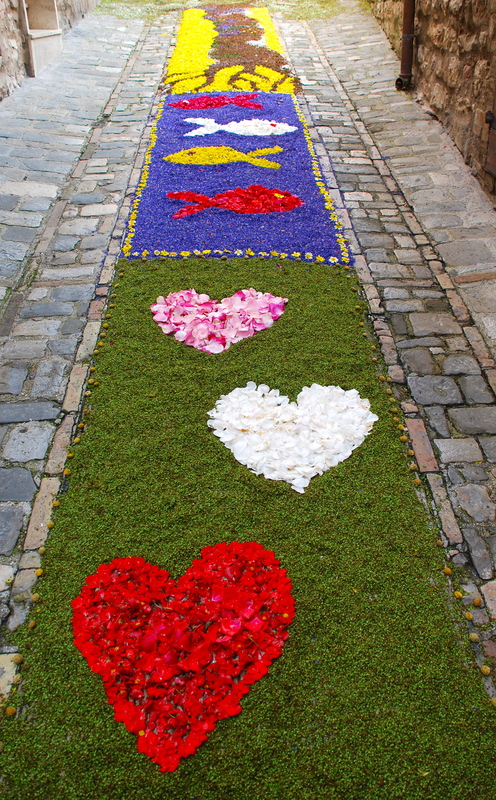 Following the celebration of a religious service to mark Corpus Christi, there is a flamboyant procession through the old town across the floral carpets led by the local bishop and his entourage. 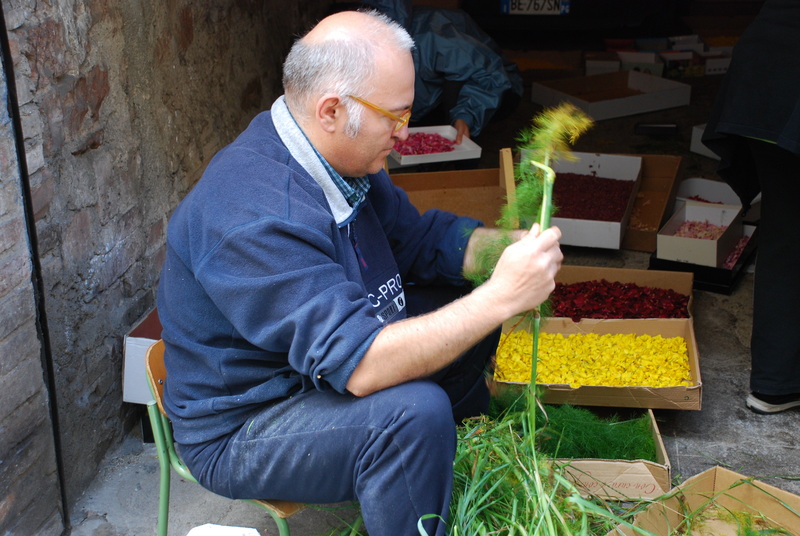 The skills of the Infiorati are highly prized and they have been called upon previously to create floral masterpieces in Rome and Venice. 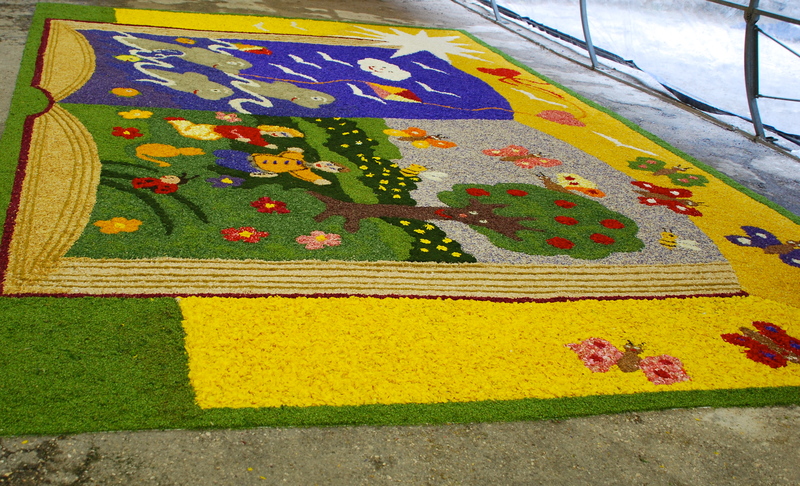 The latest commission is to provide a carpet of flowers to celebrate the visit of Pope Francis to Assisi in October. 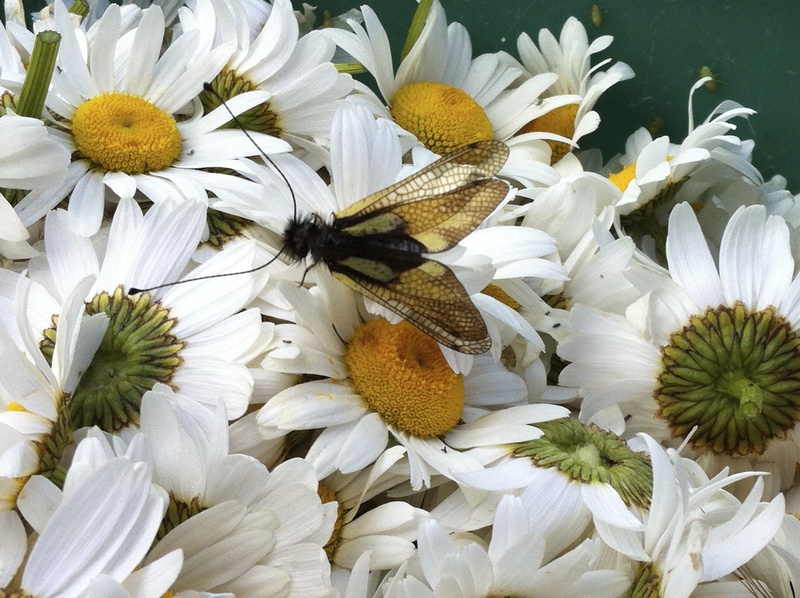 The flower gathering has already begun. 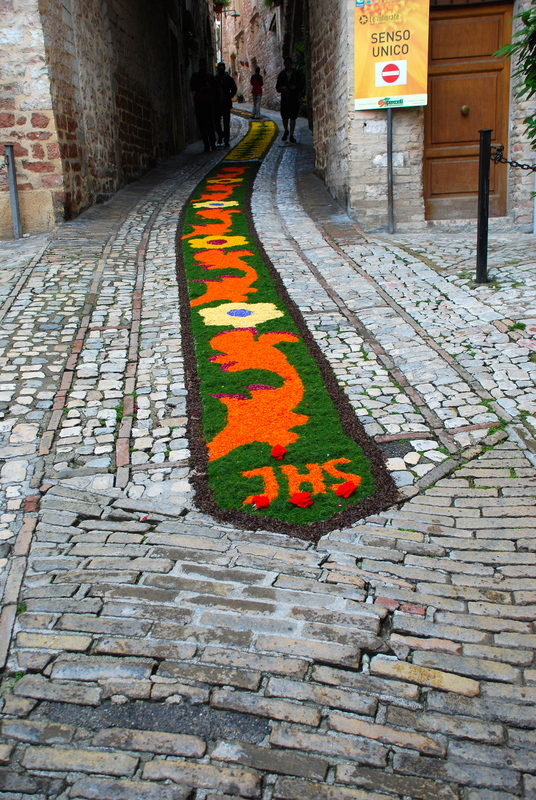 This entry was posted in Photography, Spello Festivals and tagged Corpus Christi, Spello, Spello Infiorata on June 5, 2013 by maryshoobridge. Easter Sunday dawned with church bells ringing and torrential rain, but nothing was going to dampen our spirits as we set off to town in search of a coffee. Bar Tullia has delicious coffee and pastries and a friendly clientele. The lovely Antonio and Paola were quick to introduce themselves and curious as to why we had chosen Spello for our extended stay. Everyone is so friendly and welcoming; a true community. 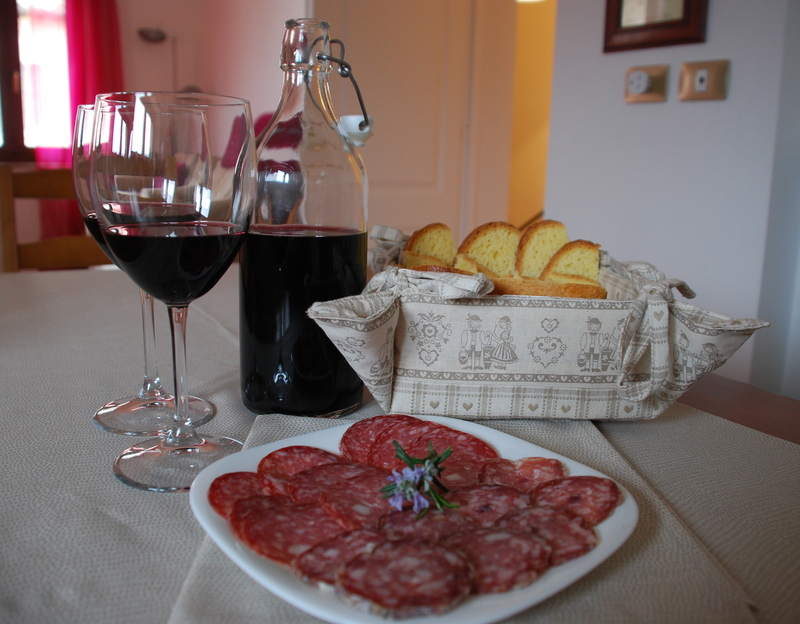 Back at the apartment we prepared the typical Umbrian Easter Sunday breakfast. Traditionally, this is eaten at 9 o’clock in the morning, but to be honest we just couldn’t face wine at that hour, so we modified our plan and held out to midday. 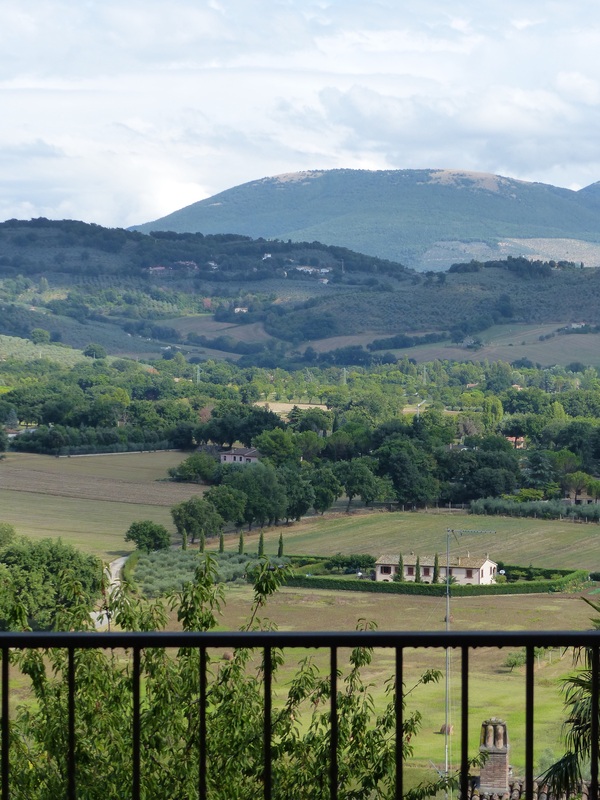 The wine is an exquisite Vernaccia, made from half-dried grapes aged in small wooden barrels. Not quite a port; closer to a Madeira perhaps, slightly sweet but rounded and delicious. The wine was accompanied by Torte Pasquinale, savoury bread with pecorino cheese and salume, dried sausage with wild boar and mule. It was delicious. 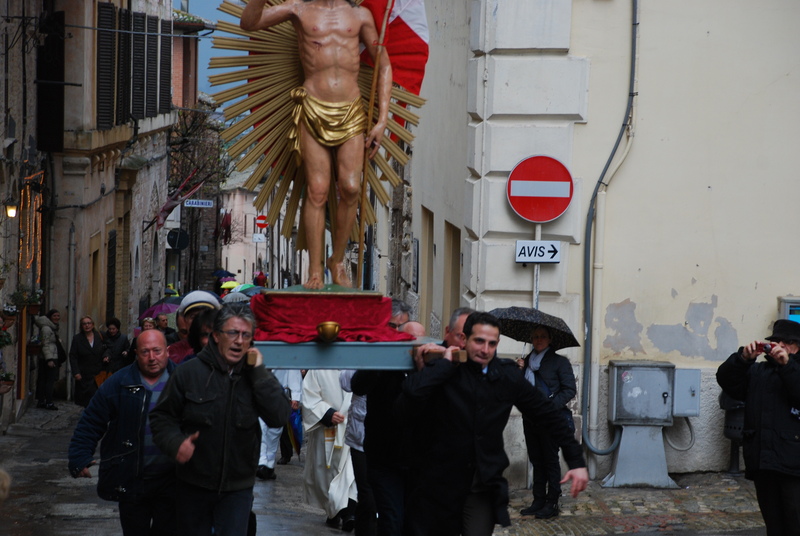 The big event of the day was “running Jesus through the streets”, when a large statue of Jesus is carried at speed by several strong men, from the church of Santa Maria Maggiore to the Oratorio of Saint John the Baptist. The heavy rain of the morning had by now matured into a raging storm, and it raged on with lightening, thunder and sheet rain threatening to drown out the traditional celebration of the risen Christ. Mio marito declared that he was not, under any circumstances, risking drowning, being struck by lightening or by a heavy statue, but he relented when he saw me swathed in waterproofs and ready to go! So off we went. 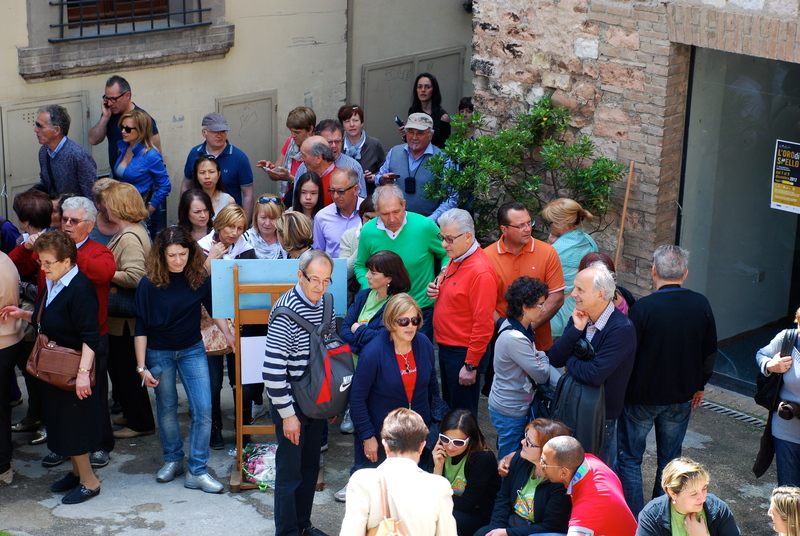 Spello – Easter Sunday. The brass band leads the procession. I saw the procession approaching from afar. “There’s Jesus!” I squealed, a little too loudly and a little too enthusiastically, as if I had just spotted Elvis. A lone trumpeter ran towards the procession, clearly late on parade. 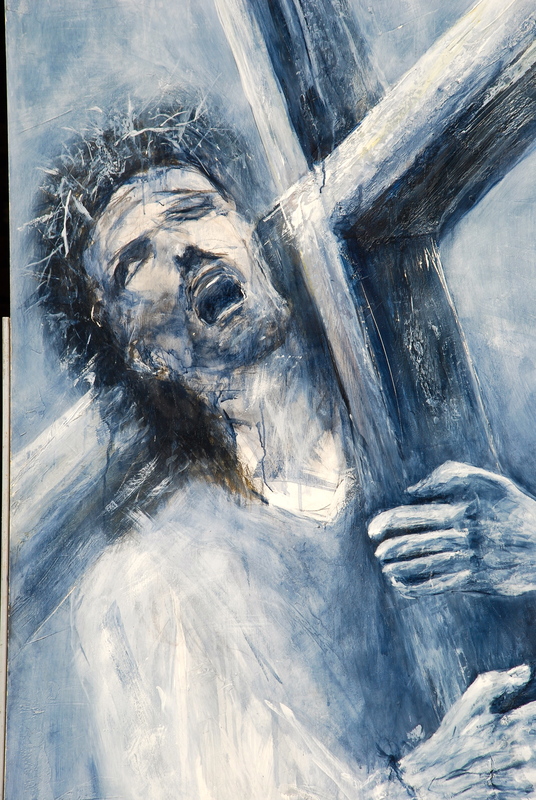 On they came, until we could clearly see the pain on the faces of the men carrying Jesus. 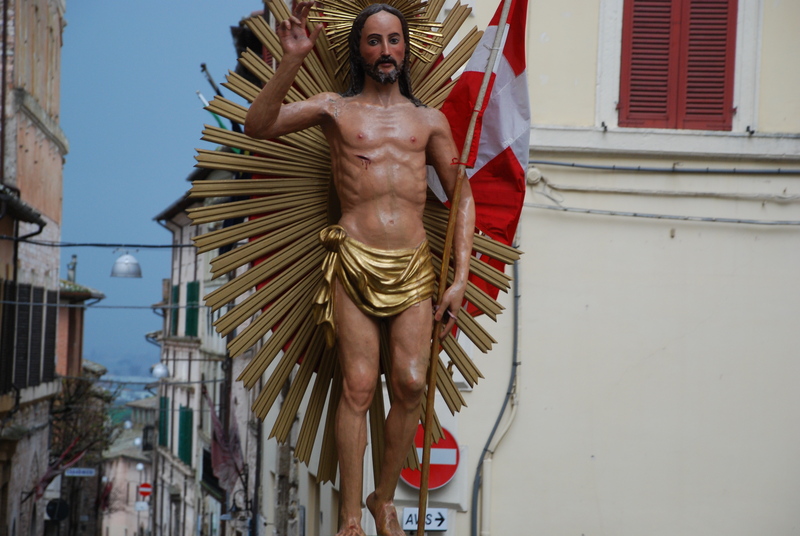 Jesus returns in triumph to the Oratorio. Finally, Jesus was returned to his home in the Oratorio and after a few prayers and votes of thanks, the crowd dispersed. Inevitably the number of people attending was reduced due to the foul weather, but bravo to those brave souls who stayed the course. 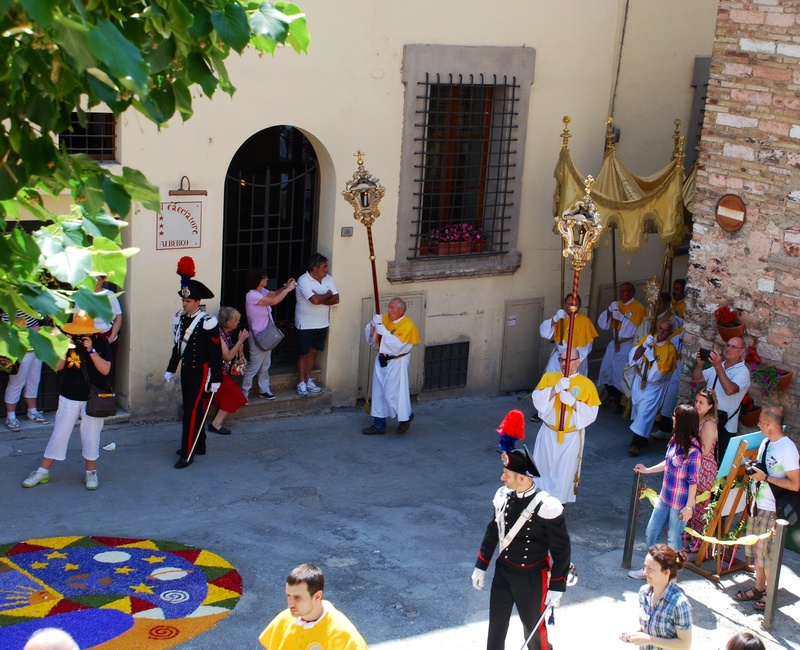 This entry was posted in Italian Life, Spello Festivals, Umbrian Food and Drink and tagged Easter, Running Jesus Through the Streets, Typical Umbrian Easter Sunday Breakfast, Vernaccia on April 1, 2013 by maryshoobridge. Italy is a Catholic country. Around 90% of the population – so about 57 million people – describe themselves as Catholic, although not all practice their faith. 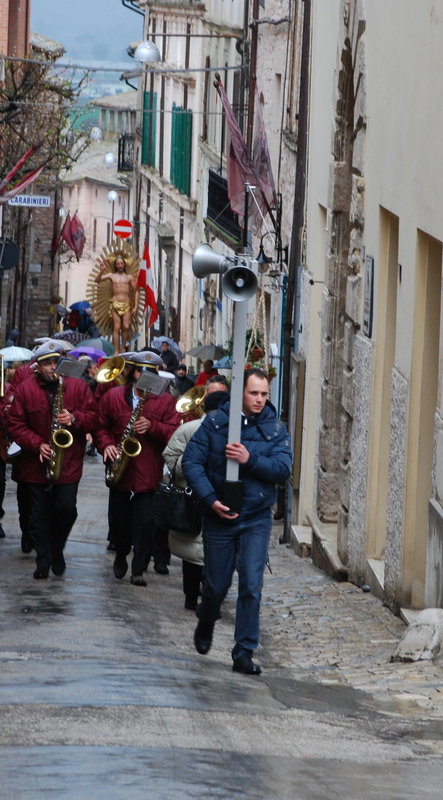 Good Friday (Venerdi Santo) is marked throughout Italy by parades to remember the Passion of Christ. 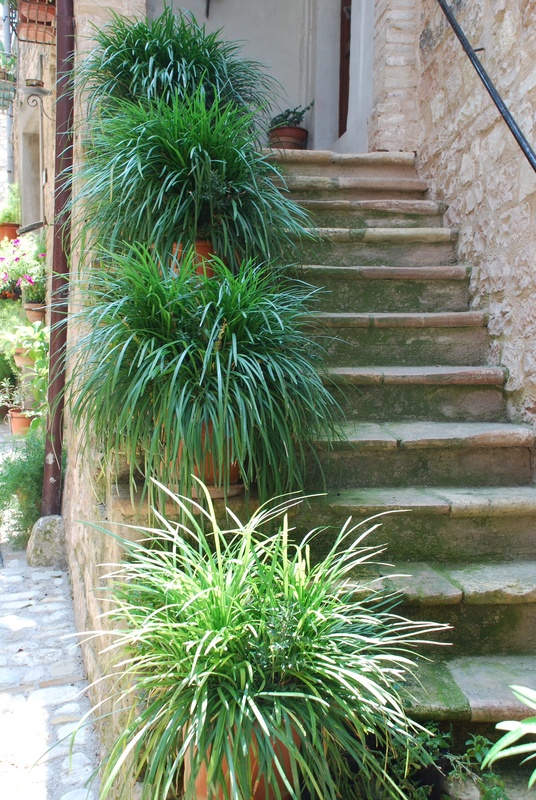 Spello is no exception, so the streets of the old town were closed to traffic (a blessing in itself!) and candles were lit throughout the streets. Our entrance looked enchanting. 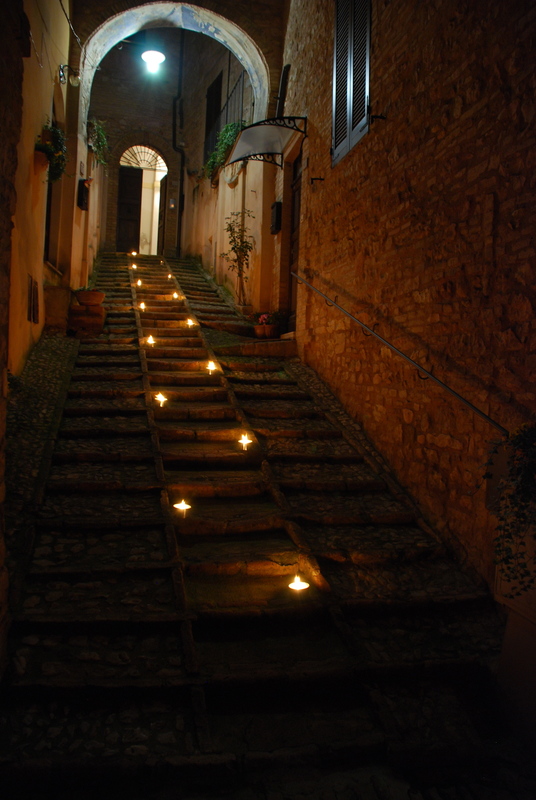 Entrance to the Nunnery by candlelight. 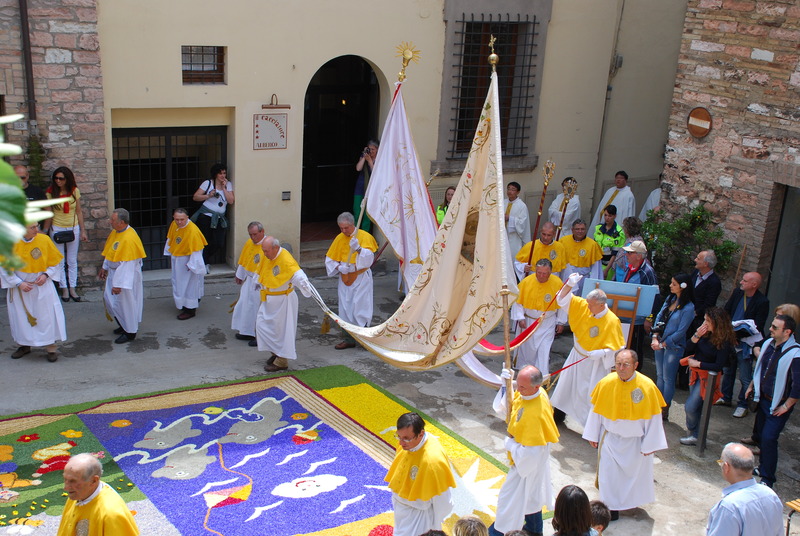 The historic centre exhibited large paintings of each of the 14 Stations of the Cross, and this formed the route for the evening procession (Via Crucis d’Autore). The crowds (hundreds of people) followed behind the group of priests and church officials. The local mayor and polizia were also present. At each Station of the Cross the procession halted and extracts from the Gospel were read. Then the main priest – with his microphone in hand – led the followers in prayers and singing as they walked to the next Station. 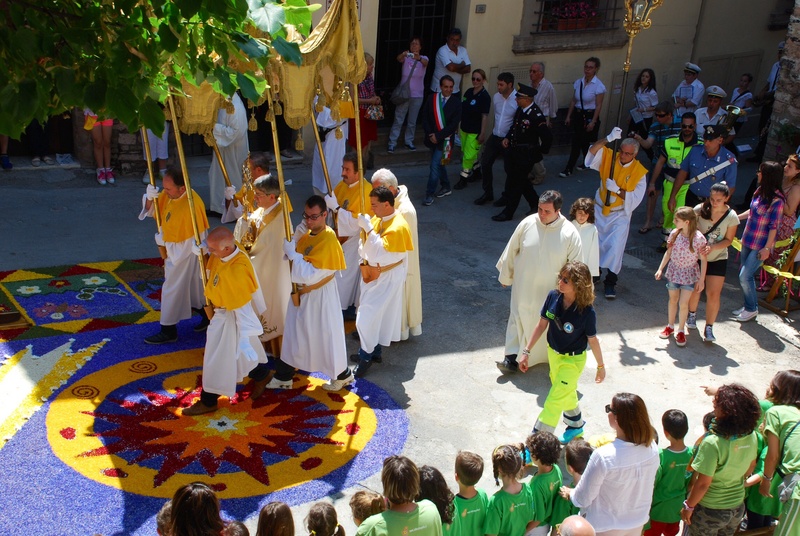 We are not religious, but we are keen to experience the local traditions, and so we joined in with the procession (though not the prayers and singing!) around the steep streets in the shadow of churches and other buildings; those stones have overseen processions like this for hundreds of years, and hopefully will continue to do so for many more. A moving evening. 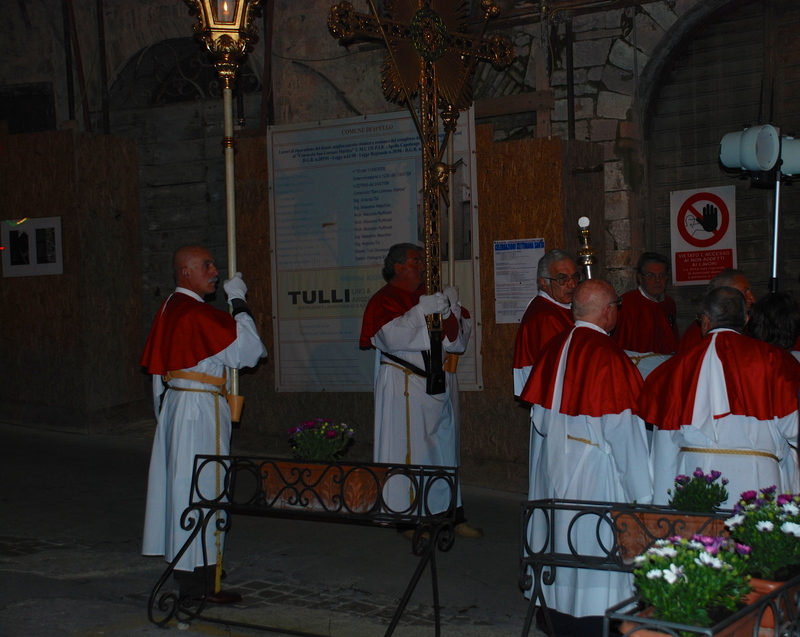 This entry was posted in Spello Festivals and tagged Catholicism, Christ, Good Friday, Italy, Jesus, Passion, Spello, Stations of the Cross on March 30, 2013 by maryshoobridge.